This page provides news and updates relating to the video99.co.uk audio and video transfer business. Regular customers can come back here to see what is new. Warts and all, sometimes you get to read of things going horribly wrong too! It's a little blog. April 2019. An extension to the home starts this month so there may be times it is quite noisy. Email could be better than 'phone calls at times, but the studio is otherwise unaffacted so it's business as usual. Though the extension is purely to the family home, one good consequence will be that the workshop (that's not the studio, but the much smaller room where equipment is serviced), will be moved into a very slightly larger room. The move will allow me to make the new workshop much more YouTube friendly so we can do YouTube videos about more of the equipment servicing. The Power Supply From Hell on YouTube shows a HP power supply from 1966 which has a bit of a design compromise. March 2019. Servicing Umatic video recorders on YouTube. We now have a Sony PCM-601ESD PCM decoder which has a digital output factory installed. February 2019. Please see my in-depth YouTube video on repair of the most complex domestic video recorder of all time, the legendary Sony EV-S9000E. January 2019. The worst possible thing that can happen to a N1502 or similar machine, is to damage the heads, since they are virtually impossible to obtain. So when the head cleaner stick snagged on and split a head tip on our main N1502, this made for a seriously bad day. Fortunately when making the YouTube video about the VCR format a while ago, I came across a scrap N1500 machine which seemed to have an intact video head. So I pulled this out of my store room, extracted the head drum and installed it into the N1502. Despite the disaster then, within a few hours we had the N1502 machine up and running again. If anyone has a scrap N1500, N1501 or N1502 Philips VCR format machine with intact heads, that they don't require, please do let me know. December 2018. We have now completed all work for Christmas, but will be working between Christmas and New Year, which can be a great time to get jobs turned around quickly. Our latest YouTube videos include DVCPRO. As ever, tbe boys get bit parts of course. We have also released a video on the PCM1610/PCM1630 digital audio format and a Christmas Special which tells the story of our business. Please subscribe, it really helps. November 2018. Did you know that just 1% of Wikipedia users donate to their cause? We are proud to be amongst the 1%. Our latest YouTube video demonstrates clearing mould from Video8/Hi8/Digital8 tapes, and also a tape foldover defect. The next YouTube video will be about the DVCPRO format. When working on this I pulled back a AJ-D230 machine which I had considered to be a write off some time ago. Having looked at it again, I've found a workaround which makes it serviceable, but I'm hoping to complete a full repair on it at some point. October 2018. The back started peeling off my Samsing S8+ 'phone. I use this quite a lot for business related work, so a fault was not welcome. I suspect the problem may be that the battery has swelled up and is pushing the back off. It's been sent back for repair and my loan 'phone is a horrible old Apple S5. This doesn't have any of my usual apps and features so I'm really going to struggle for a week or two until my 'phone comes back. Please do not call me on my mobile number unless absolutely vital, until I report that the proper 'phone is back. I can't easily do text messages, and the sound quality on this Apple device is quite poor too. There is no wireless charging either and I don't want to go through pairing it with my car's Bluetooth system, nor will allow remote operation from Windows 10. ** Update: Samsung 'phone is back and I've happily returned the nasty Apple 'phone to Vodafone. Total job only a few days, but the 'phone came back with a factory reset applied so I've had to go through some work to set it all up again. I have (had) a Samsung miniDV camcorder which I would put out of alignment to match badly recorded miniDV tapes. On one such job, I had set it up to play the bad recordings (quite well too), but then alas tripped over one of the connecting cables. Because the Samsung was semi-dismantled in order to access the deck alignment in this mode, the drop was not protected by the case, and the camcorder is now damaged beyond repair. While this is all bad, it did cause me to have to set up another unit for "misaligned" jobs, this time a Panasonic. Actually it seems to do the job better than the Samsung did, partly because access to the deck is a bit easier once I had removed one of the exterior parts. I also have a Digital8 camcorder which I put out of alignment to match bad 8mm recordings in the same way. A look at small format video cassettes on YouTube. September 2018. The Aiwa Stereo Cassette Deck model XK-007 Excelia arrived. There was a small mechanical problem with the tape/source monitor switch which I was able to repair. It's a superbly built piece of kit. I plan on replacing the Aiwa AD-F770 with this new deck, and will keep the AD-F770 to one side for occasions when I need to run multiple cassettes at once. There are a couple of useful features on the F770 which are lacking in the XK-007, which I will miss, but you can't deny the technical quality of this XK-007. It is, however, heavy. A new audio shelving unit will be constructed soon to better allow good access to this equipment. One of the JVC DR-MH200 DVD recorders would not boot. I last went through the power supply replacing capacitors on this unit a little over 2 years ago. A collection of around 8 capacitors were performing badly, some were open circuit. Mostly they were 22uF and 100uF values. Once replaced the machine worked perfectly again. We are continuing to do new YouTube videos every week or two. Please do subscribe to see some of the things we get up to. August 2018. There is a very old PC which used to be our main email and office machine until it was semi-retired back in March 2016. It still gets used though, especially since it has an interesting selection of DVD drives, which can sometimes read back from a customer's DVD where newer models won't. One day the machine refused to boot. Usually this is because a SATA card has gone off-line, it just needs a little fiddling about in the BIOS and it will run happily. Now though it won't see the SSD boot drive at all. It quickly became apparent that the OCZ Vertex 2 SSD drive had completely failed. This is bad because, quite apart from having to buy a new SSD drive, it means re-installing Windows and all the applications, which takes a lot of time. It will probably mean buying a new Windows license too because it was running Windows 10 which had been installed when Microsoft had free upgrades from Windows 7. This is a proper pain. There's a new YouTube video on how I repaired phase locked loop timing jitter on the S/PDIF output modification board used on PCM F1/501/701 decoders. We're going to do more YouTube videos as we get time, so do subscribe to our channel there. To help with this we bought a Neewer NW-700 Microphone Kit. But the microphone didn't work when connected to either of our professional Tascam digital audio recorders. It worked (after a fashion, very quietly) when plugged directly into the PC, but then there was no 48V phantom power so it was bound to be quiet. After a lot of messing about, I found that connecting pin 1 (ground) of the XLR connector of the microphone to the body of the socket, allowed the microphone to work perfectly with the Tascam recorders. I wonder if this is a wiring fault in the microphone, or some sort of XLR cabling issue. Neewer replaced the microphone and I did a YouTube video on how I repaired the defective one. Coming soon: Aiwa Stereo Cassette Deck model XK-007 Excelia. July 2018. These days, very few customers take transfers on DVDs, virtually all are done to video files on a hard disk. If there are just a few tapes then they can go onto a USB stick, which I keep in stock. But for just one or two short tapes, or for smaller preview files, I can often upload files to a customer provided they have reasonable broadband, using the wetransfer.com file transfer service. Until now, the paid-for version on this has been limited to a 20GB in one file, and 100GB of total storage which was across all my customer files which I will typically leave on the system for a week. However we are delighted that the 20GB limit has now been removed and the total storage limit is now 500GB. The most useful part of this is the 500GB storage, which means we no longer have problems with juggling files for different customers to avoid busting the limit. The 20GB single file limit removal could come in handy too, but with out upload speed having wilted down to about 6Mb/s recently, it's still about as much as is sensible to upload in one go. We would dearly like FTTP fibre broadband but there's no real prospect of that being available in the area for some time. Some years ago I had a TP-Link AV200 / TL-PA211 data powerline unit go completely dead. It sat in my workshop awaiting one of those days which never arrives when I get time to fix such things. However the day did arrive when I had a few minutes, so after a battle getting it apart, I probed around inside. The fuse was OK and the high voltage side seemed OK. But there was a bulging capacitor, 1500uF 6.3V. Clearly it needed replacement but when removed from the board, it actually read high capacitance, around 2600uF, with zero ESR (effective series resistance). Now in all my days of electronic servicing, I have never seen a bulging capacitor go high in value. A second opinion from another tester also read high value. I found a 1500uF 10V capacitor from a scrap JVC DVD recorder power supply, this was much bigger than the original but could be installed in a different orientation to the original. Then the unit powered up fine. That said, I don't actually run a mains power network any more, so it probably was a waste of time repairing it, but sometimes it's useful just for the experience. And that high value capacitor? Further tests imply that it has gone leaky. We are delighted to announce that we have moved the video99.co.uk domain from Plusnet to Winserve. This has allowed us to enable SSL security, so the web site is now https:// rather than just http://. This prevents warnings of an insecure web site, which is particularly important since we do have an order form which takes customer information. This change ensures that data passed between the web server and customer browser remains private. June 2018. We run most Beta (Betamax) tapes on a Sony SL-HF100 Beta HiFi deck, just because it's so good in both picture and sound even for tapes which are not recorded in Beta HiFi. So we were disappointed one day when it was switched on, but was completely dead. After checking a few obvious things, we found that high voltage DC was present after the mains bridge rectifier, but the switch-mode power supply was not running. There was only so much time that was worth spending on this, knowing that in the loft there was a scrap HF100 (someone had smashed the video heads and it also has other faults). The power supply ran fine on the scrap machine, and changing it over is not a terribly big job, so we swapped them. The target machine now ran fine and was running customer tapes without too much delay. The power supply on this model is reasonably reliable, but we have to bear in mind that these things are around 35 years old. I had recently bought a Panasonic AJ-D950 DVCPRO-50 deck which worked well. However one day we found that it was unreliable when loading M-sized tapes. These are the ones which are almost exactly the same physical size as 8mm tapes. The larger "DVCAM" sized tapes worked reliably. We got it into the workshop and investigated. During the fault condition, it was clear that the supply spool was not feeding out tape during lace-up, nor taking it back in during unlace. The supply spool brake actuator solenoid could (just about!) be seen to be working properly in all modes, as was the takeup spool brake actuator. Once however we noticed that the tape made a loud noise during unlace, and this was the clue: The supply spool wasn't making proper contact with the cassette itself, because the spool was not properly located. The spools slide out on rails and guides to switch between the two tape sizes. Greasing this mechanism was all that was necessary for reliable operation. This involved a certain amount of dismantling of the top of the cassette carriage, but wasn't quite as hard as it looked. Alas your engineer hurt his back quite badly when shifting some camping equipment, so I am finding everything a little bit of a struggle at the moment. But I've done this before and managed to recover, eventually, so hopefully it will improve shortly. May 2018. I picked up another Panasonic AG-4700 recorder, which is my favourite S-VHS machine. Unlike all the other machines I have of the same model, this one includes the automatic head cleaner mechanism that is usually fitted to K-series decks. It came in with the usual split plastic coupling on the loading motor. It's not trivial to fit, but fortunately I have some spares so was able to get the machine nicely repaired after about an hour of fairly fiddly work. We had finally recovered from having to do a fresh Windows 10 install on our main PC, due to a problem with the 2017 Fall Update falling over. Virtually all apps and documents are fully recovered and we were basking in the joy of a job well done. For two weeks. Then it came time for the new 2018 Spring update, and guess what, it won't install. So we're looking at re-installing Windows twice a year on this thing. It would be cheaper to dump the almost new computer and start again. All very frustrating and there's no obvious solution right now.... This update was falling over with a USB fault code, so I tried something: I unplugged all USB devices except keyboard and mouse during the update and.. It worked! Joy all round. Your hard working engineer at video99 has been very under the weather for the first few weeks of May. Running a temperature and so full of pills that I rattle. Furtunately the workload has been fairly light, which is unusual but couldn't have been better timed. This was followed by a short break at Alton Towers. We're now back and catching up on the work. We've always had a problem with the Tascam SS-R250N digital audio recorder, in that sometimes it will corrupt an audio file. This meant running the tape again to re-do the recording, which was deeply frustrating. Multiple SD cards have been tried and many conversations with Tascam's UK dealers were not resolving the problem. They asked me to provide a sample defective recording on an SD card, and at this point, the real problem came to light: It wasn't that the recording on the SD card was sometimes defective, it was that the automated FTP transfer from the Tascam to the PC was sometimes failing. The file on the SD card was just fine. So all I have to do in the case of a defective transfer, is manually FTP the file over again. OK, it's not ideal that the unit doesn't check that the automatic FTP service has completed properly, but now at least we have an easy solution when it does go wrong. April 2018. We have now bought no less than four different types of Pioneer Laserdisc player remote controls, yet none of them work either of our Pioneer laserdisc players. I was under the impression that there were not many different code sets for these remotes, but clearly there was! If anyone has a Pioneer laserdisc remote control that they no longer need, please let me know so I might be able to finally find the correct remotes for our two machines. Alas after many hours of work with the Whistlewood SPDIF add-on for the PCM-701ES, I had to admit defeat. It works only when it feels like it, which is not very helpful. March 2018. We now have a Sony J-H3 HDCAM player for transfer of the HDCAM variant of Digital Betacam. Transfers will be be via SDI to very large video HD file formats, or to Standard Definition DV-AVI files if required. Note however that this machine does not support the HDCAM-SR variant, which will have to wait a little longer for a suitable machine to turn up for those. After a few technical problems initially, new professional grade SDI cables have been purchased to get reliable capture from this format. We now use D & D Rubbish Removals of Plymouth to dispose of our commercial waste, generally video tapes that people don't want returned (though I do recommend return of tapes), packaging material etc. We have bought a wheelie bin to make this easy to transport. Once we have cleared the backlog of tapes which have been piling up (!) we expect that a monthly collection will suffice. Customers are charged just 30p per tape for disposal of tapes except Video8 and miniDV which are light enough not to be charged for in small quantities. We get a certificate of proper disposal. FOR SALE: Sony SL-3000UB portable Beta video recorder in working order. Includes carry case, shoulder strap, power supply etc. Tuner/timer, camera, and several (probably dead) batteries also available for this machine. SL3000 has new loading belt and capstan belt fitted. Tested for playback only, nice picture and sound. Offers for this rare machine. SOLD. One of the machines we sometimes use for domestic VHS tapes is a JVC HR-S7600EK. I had noticed a problem though with the S-video output on both the SCART and S-video connectors; it would sometimes flicker slightly from the SCART output and there was no S-Video from the S-Video connector. Now this is a later model deck which was built with absolutely no thought to repair access. The rear panel with the connectors on it could have been easy to access if a couple of screws hadn't been covered up by a plastic panel. So the whole machine had to be completed stripped down with the deck and main PCB out, in order to access the rear PCB. Once out though, some very obvious dry joints were seen around the S-Video output socket. Once resoldered, the whole thing had to be reassembled for testing, but fortunately it then worked perfectly. My preferred S-VHS decks are the Panasonic AG-4700 and similar, but sometimes a tape will play better in another model such as this JVC. Reminer to self: Don't get sentimental about video recorders. Someone was trying to avoid having to dump their old Beta camera, portable SL-3000UB recorder, tuner/timer and accessories, so I agreed to pay for the transport costs and also do a small transfer job, in return for the equipment. The recorder was supposed to work. Did it? No, the capstan motor had seized and the belts need replacing. I got it working after a fashion eventually, and will need to order belts. But why? I don't really need this machine. It's soaked up a lot of time already and I won't make anything from it. Some old machines just aren't important enough to save. A nice Beta hi-fi or SuperBeta, now that would have been worth the time and trouble. UPDATE: Fixed this machine and it is now looking for a new home, perhaps a collector who likes unusual but working machines. February 2018. Things don't always go as smoothly as you might hope when computers are involved. Our main PC which handles all the emails and billing etc., is unable to install the Windows 10 Creator update version 1709. This is proving to be a real pain because it is getting increasingly agressive with reboots and failed installs happening repeatedly, even in times when it's been told not to do reboots. This cannot carry on! We have bought a new SSD boot drive and started a new Windows 10 install on that, swapping the new and existing boot drive over as time allows for some more work on the new build. It's time consuming, re-installing dozens of applications, dealing with licensing inssues etc. I'm hoping we will be able to go live with the replacement SSD by the end of February or in March, but we've had some stability issues too (failed boots due to BUGCODE_USB_DRIVER) so this is all very stressful. January 2018. Legislation from 13.01.18 makes it illegal to include Paypal fees for customers using that payment route, unless the fees are added to all means of payment. That hardly seems fair since most customers pay by bank transfer / PAYM anyway. So we've had no choice but to remove Paypal as a payment option, sorry. This was a very badly thought out piece of legislation, and Paypal should have pushed against it. Lots of small (and even large) businesses have come to the same conclusion. We now have a new barcode scanner, which we will use to scan the barcodes of nearly all of the outgoing post which can be scanned (Recorded Delivery, Special Delivery, Parcel Force and international tracked & signed). This will allow us to easily provide barcode information to all customers whose packages have barcodes, rather than just those who specifically request it. Usually when tapes are returned, after a customer has the transfers, small packages go by normal 1st Class post for which there is not a barcode of course. December 2017. The Alesis AI-1 converter arrived from USA to allow for digital transfers from the Alesis XT20 to the Tascam SS-R250N. Works a treat. We now have a Canopus ADVC-1000 which allows for a pure digital transfer of SDI data to DV (from Digital Betacam, DVCPRO, DVCPRO-50), for those customers who require DV-AVI files rather than the very large files available directly from SDI. Not everyone can use those very large file formats such as 10-bit YUV, but DV-AVI works with virtually any PC or Mac video editing software. Of course, the very large file formats are also available for customers who require them. I have a specially modified Sony DCR-TRV120E Digital8 camcorder which I can tweak the head guides on, to match badly aligned 8mm recordings. It doesn't get a lot of use, but when it does, it's priceless. So I was very upset when the function buttons all died, and that included Eject making the unit unusable even via remote control. The problem was of course caused by a fractured flexi-cable from the function buttons, which are badly placed on these units on a hinge-out panel whch has to be opened to operate the eject mechanism. In use I normally leave this panel open in order to minimuse wear on this poor design, but anyway this particular one had failed. I had a scrap unit with a bad deck fault, in my spares drawer. But could I really change this over? Camcorders are notoriously hard to work on, I knew it would be a challenge. But about an hour later, it was all back and working. Well I couldn't seem to get the zoom switch spring in the right place, but since these are never used for actual filming any more, I could only spend so long battling with that before the spring went whizzing off past my left ear anyway. But despite that tiny setback, the unit was fully reassembled and able to work reliably again, for those occasions that customers have Video8, Hi8 and Digital8 recordings which have been made on a camcorder with a misaligned deck. The SS-R250N started giving some bad recordings, because I had chosen the wrong type of SD card. It had to be SDHC (not SDXC), UHS-1 type by SanDisk. I bought two 16GB ones as recommended by Tascam and the recording problems went away. November 2017. After the success of the DTRS 8-track digital audio equipment, we've added an Alesis XT20 ADAT type 2 recorder which plays 16-bit and 20-bit 8-track digital audio recordings from S-VHS tapes. I'm also arranging for equipment to allow for a pure digital transfer from this format too. We have ordered a new Tascam SS-R250N digital audio recorder, which will allow for more throughput with some large audio transfers, and is also very convenient in having a network port for transferring the files from the recorder to computer, rather than messing about with a USB cable on the portable Tascam DR-100MKII. The new unit has various other features which are going to help with some audio transfers. I've done a review and you can see some of my other audio kit on Youtube. The DPS-375SP Digital Timebase Corrector is now set up and working for Umatic transfers, which can get the benefit of the Umatic Dub colour system and also the Digital Dropout Compensator. With all the new audio equipment in, much of it heavy, it was finally time to remove the last of the plastic shelving units we bought when we moved back in 2012, and replace it with a much stronger steel shelving system. However no-one made a unit of the exact size I required; I needed a fairly short unit but deep. So I bought a long deep unit and a short narrow one, and mixed the parts up to make a short deep rack. My father helped by cutting the MDF shelves to the right size and the whole thing went together very well so it fitted in the same space as the old plastic unit but can hold far more equipment. I hope the floor is as strong as it looks. October 2017. Sometimes my dear lady wife tells me off for keeping too much junk. But I keep it anyway just in case it comes in handy one day. So when I bought a new HP 2605dn colour printer back on March 2014, I put away the old one which had print quality problems, just in case. This week I found the laser printer was strangely acting up. As well as a minor paper handling issue, solved with new paper pickup roller and pad, the printer would sometimes abort a job and do a reset. A self-test printout would sometimes generate a Error 79 (firmware). I suspected a memory fault, so removed the SIM memory I had added, but the problems remained. Various resets and a (failed) attempt at a firmware update got me nowhere so I installed the CPU board from the scrap machine which had been sat in storage for three years. Instant success, the printer now functions flawlessly and produces super print quality. The scrap one was reassembled and goes back into storage, just in case I need another part one day. However, in a twist to the tale, the old one also worked even with the dubious CPU board. That's worrying, I really wanted the defect to go across with the CPU board. Is the new one fixed or just working today? Only time will tell, but so far so good. We've had a lot of trouble with the hosting company which is supposed to host the order form. Eventually patience ran out with them and we moved to a new hosting company which seems to be hugely better. After a bit of a battle, our new DPS-375SP Digital Timebase Corrector is now working properly with Umatic machines. The reason this is such a huge step forward is that it handles conversion from the Umatic Dub signal to S-Video (or YUV) for capture, and also adds a Digital Dropout Compensator function. This is the holy grail of Umatic transfer capability, it's been a long time coming. The new system is not fully operational just yet, we need some more cables and to lay out where all some of the equipment will go, but it should only be a week or two now. We took a little run to London to collect some equipment we had purchased, which included a Panasonic AJ-HD1700 DVCPRO-HD deck, and traded in the AJ-SD955 DVCPro50 against that. The Tascam DA-88 DTRS 8-track digital audio recorder was augmented by Sony PCM-800 and Tascam DA-98HR machines, and we've now set these up so we can do a pure digital audio capture from this format in both 16 and 20 bit modes. Also collected from London was a superb Sony PCM-7040 DAT recorder. September 2017. We have three items coming in soon: Tascam DA-88 8ch digital multitrack audio recorder, Panasonic AJ-SD955 DVCPro50 deck, Sony PCM-7040 DAT recorder. The idea of the DVCPRO-50 and DAT machines is primarly as backups for existing equipment. The Tascam DA-88 is an additional format variant: Some recording studios used these to record up to 8 audio tracks in PCM on 8mm video tapes, it was a fairly successful format for a while and one I've wanted to add for a while. This is unrelated to the 6 stereo tracks PCM audio feature on some Sony decks such as the EV-S800, which we also support. A JVC DR-MH200 went down with DVD writer failure. I was able to swap in the DVD writer from a scrap DR-MH300 (which refuses to boot despite a PSU re-build) and it worked. As mentioned further down, there are two versions of the DR-MH300, one has a non-standard writer with different connectors and cannot be readily exchanged. I have two of that non-standard type, both with defective DVD writers. We were really pleased to finally source the special remote control for our Pioneer NTSC CD/DVD/LD player model DVL-700, since these take a different set of remote codes than the earlier LD-only Laserdisc players. We were much less happy when it transpired that there must be at least three sets of codes for Pioneer LD players because it didn't work. Most functions are accessible by the machine's front panel, but the linear / digital audio selection function is not. If anyone has a remote control for this player, please let me know. July 2017. According to the BBC News, from 1st January 2018, business will no longer be permitted to calculate the charges applied by Paypal for such payments. The vast majority of our customers prefer to pay by bank transfer anyway, but this new rule is unhelpful for customers who would rather pay with Paypal, especially international customers where bank transfers can be troublesome. Some businesses will simply increase the costs for everyone but I don't want to do that considering the very small number of customers still using Paypal. So in order to comply with this new rule, I will have to impose a limit of £50 for Paypal payments. Any job which is billed for more than £50 will have to be paid by bank transfer or cheque, from 1st January. Up to £50, we will cover the charges ourselves, and beyond £50 we will not be able to accept Paypal. As Paypal is less relevant today, try PAYM instead. June 2017. Sometimes it's just one of those days where it all goes wrong, and such it was one Friday morning in June. It started when a JVC DR-MH200 DVD recorder suddenly started rebooting itself endlessly. I swapped it out with a brand new spare DR-MH300 machine, which worked for a couple of hours before the DVD writer failed. Then the Panasonic AJ-D230 DVCPRO deck failed, but fortunately the new DVCPRO machine came to the rescue there. The AJ-D230 looks terminal, there's something horribly wrong with the deck. Then just as if the day wasn't bad enough, one of the cameras on the CCTV system suddenly went off, the camera is only 2 months old but had failed. A replacement was ordered. Once the panic was over, I got the DR-MH200 DVD recorder into the workshop and went through the power supply checking capacitors with the ESR meter. Around 8 capacitors were worth changing, though some were still in spec. Strangely though, one of them, in the primary part of the power supply, was one I had already changed at some point in the past (5+ years ago), with a high quality low-ESR component. It would seem that the power supply design may be stressing that particular component. With fresh capacitors installed where required, that recorder went back into service and works fine. Fewer customers than ever are still requesting DVDs, I always recommend video files instead, but still these machines do get some use. The new, defective, DR-MH300 may not be much use since a replacement DVD writer will be impossible to source (and, annoyingly, seemingly identical MH300 recorders can have entirely different DVD writers installed within them which are not readily interchangeable). May 2017. We now have a full Umatic PCM digital audio sytem consisting of a Sony DMR4000 Umatic player connected to PCM1630 decoder which supports RAR (read after read), to give greatly reduce the chances of tape defects affecting the sound. It was bought at some expense from an eBay seller who promised it all worked, well it didn't, but it does now after some attention to the Umatic machine's front loading mechanism. The PCM-100 decoder is surplus to requiremenmts and available for sale. We've bought in another AG-4700 SVHS deck, this one needed some work but I fortunately had a scrap deck which provided all the required cosmetic parts. This model is a firm favourite. The tape counter failed on the Ferrograph Super-7 open reel tape deck, but the supplier was very helpful and provided a replacement which I installed. Two of our little usedspare BetacamSP UVW1200P players were dug out of retirement to help with a large job, and neither worked. One has poor colour (head failure suspected) and one is giving random error numbers implying reel sensor problems. Fortunately we have enough alternative BetacamSP capable decks so I was able to just turf these two out into storage awaitng a very long quiet weekend when perhaps I can repair one of them. April 2017. Much of April was taken off for tax reasons, but there were a number of background tasks to do. They included: Properly installing the DVCPRO-50 deck by moving a lesser used Digital Betacam player to an alternative capture computer. Try (and fail) to fix a Macbook Air which has being lying around for months. Repair an EVS-9000E Hi8 deck which had been given to me (actually I also repaired on of my other ones too which had been taken out of service, so that was a double success). Buy in some new equipment for the workshop, including a component tester and new soldering equipment. Tidy up the workshop (only done to some extent, needs more time). Repair a Sanyo VTC-6500 Beta video recorder which needed new belts, and as it turned out, also a replacement head preamplifier module (this job took much longer than expected, but was worth it because this machine has virtually new heads installed). Install new audio and video cabling and switching in several systems, to make it quicker to change over from one source format to another. The 3TB hard disk in one of my machines suddenly failed. Now since I have some 0.1 Petabytes of online storage, it's simply impossible to back up everything, so I was quite lucky that this particular drive was installed in one of my older and lesser-used systems, hence the data loss was relatively painless. The failed drive was a Toshiba DT01ACA300 which was just a few months out of warranty, it (usually) spins up but appears as "RAW" file fomat, so the data is probably lost. It's being replaced by a 4TB Seagate drive. March 2017. We have had to shut down for a few weeks from the end of March through towards the end of April, because our overall turnover (which includes post) was too close to the VAT trigger threshold. We're really sorry to have to say no to requests, but we absolutely cannot afford to trigger VAT registration, which would mean effecrtively working for 2 months of next year for less than nothing. A Panasonic NV-HS950 S-VHS deck made a nasty groaning noise and failed to lace, unless or eject a tape. I've had this before, the cause is a coupling in the loading motor worm drive, which splits, and I have a few spare couplings. Fitting one is normally a straightforward task, if a bit time consuming. But this time there was more to it. The problems were deeper than just a broken coupling, the deck itself was not well. A broken plastic cam follower fell out of the deck, and though I never did find where that came from, it was enough to know that the deck was in a bad way. So I rummaged around in my spares room and found another deck of the same type... well almost the same anyway. It was from a simpler mono machine, not S-VHS or HiFi, so the heads and pre-amplifier system were completely different. So I swapped over the heads and preamplifier, then the erase head (not that I'm ever going to use that, but for completeness) since the connector on that was different. I then installed the new loading coupler in that and tested it. It sort-of-ran, but the audio/control head was way out of alignment for some reason. Rather than mess about with it, I installed the whole A/C head assembly from the original machine, so that alignment required very little adjustment. I also selected the best auto head cleaner roller, pinch roller and reel clutch. So it was, after several long hours, that the machine was brought back to full service. This explanation is a simplified version of the actual battle which also included a third deck which didn't work at all because it was mistimed or damaged for other reasons. My seven year old boy and I built a kit oscilloscope (DSO Shell DSO15001K) for simple signal checking in the studio. Great fun, worked first time. A rather limited bandwidth but you can see if there's an audio or video signal. We have bought a professional CD/DV/BD disc polishing machine. Customers sometimes send CDs or DVDs that they want to recover, and this machine massively reduces the amount of errors from scratched discs. It is however quite expensive to buy and run. February 2017. The Commodore 1541 from eBay was supposed to be working, but what that actually meant was it was working when last tried, many years ago. The green (power) and red (access / error) LEDs both lit and there was no motor noise. I started by replacing the 6522 chips since I had spares, but no difference. I then did something crazy, I swapped over UB3, a ROM chip from my 1540. I hoped the 1540 would then work, but it actually gave me the both LEDs fault of the 1541. Now the 1541 would boot with this older ROM, so I connected it up to the VIC-20. Still no motor run. Then there was a puff of smoke from capacitor C5, 100uF 16V tantalum. After more experimentation which involved trying the 1540 mechanism on the 1541, I was convinced that the machine was trying to work. So I replaced the blown capacitor and re-assembled, still with the 1540 ROM in there. And... it worked! Right, next to connect this to the old Windows 98 / XP PC that I've set up for floppy work, for which I had built a Commodore interface from a kit. But no, now the PC has quit. I think the PSU has failed, so I need to dig out an obsolete PC power supply from my junk store. This is all proving to be a battle. But at least the Commodore 1541 floppy seems to work now, and the VIC-20 still works too. I told my sonScott about the bathtub reliability curve. A brand new iPhone might well break down in the first few weeks, but once a piece of electronics is a few moths old, it settles down to probably being very reliable. But once equipment gets to a certain age, breakdowns become more likely, so creating the slope of a bathub in breakdowns. The Commodore kit at around 35 years old, is certainly rising up the slope of unreliability. All fired up with this information, my son is going to explain it to his science teacher. A customer sent a SVC4 tape. Usually when one of these tapes is sent, it actually does contain a SVC recording, which has to be played back on the one-model-format Grundig SVR4004 machine, so that's what I put it into. The recording played slow and messy, so it turned out to be an N1700 format recording (it could also have been N1500). However in testing the SVR4004 machine before inserting the customer tape, I found that my test tape had no sound. Oh dear, we have a breakdown, albeit not an urgent one since the customer tape didn't require the machine. This format is one of the very few for whieh we have no backup player, though I do have an untested one which I'm yet to service. I also have a service manual, but that is quite a low resolution scan, written entirely in German, and has errors in it. 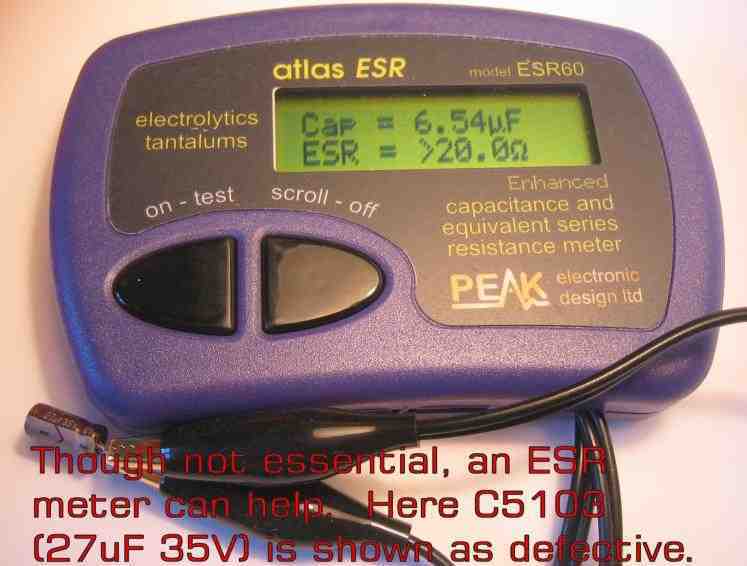 This was the manual I used when I first got the SVR4004, around 10 years ago now, I remember there was a defective tantulum capacitor on the head preamplifier PCB underneath the head drum, and a defective op-amp in the capstan servo, though how I ever managed to work out that from such a fuzzy and German manual, is a miracle. I must have had lots of spare time in those days,and fortunately I have some rudimentary German language skills. Today however, we just have no sound. I checked with an oscilloscope for audio at the modulator, and the output of the TON (audio) panel, it was missing. I then unplugged some cables to check various signal points including the contact from the A/C head. When I went to try some more singal tests, the fault had now vanished and refused to come back. A poor connection seems likely. Job done? No. The SVC format is very rare, I get perhaps one tape every two or three years for this obscure variant, and so I had lived with the problem that this machine had only an antenna RF output. An A/V output was an optional extra for this model, and my machines don't have that option. The fuzzy manual showed a quite complex panel which would be used for input and output A/V switching, we don't need all that, we just need audio and video outputs. Time to finally give this machine the connections it requires. The audio signal to the modulator jsut needed a decoupling capacitor to the audio output, that was easy. The video signal however was high impedance. There's a useful A/V output circuit here which I've used for the N1700 and N1502 machines in the past so I breadboarded that and connected to the video input of the modulator. It basically worked, I just had to add an adjustment to get the signal level correct and a few diodes to set the required supply voltage. I then fitted a BNC and phono socket on the chassis of the machine and removed the blanks on the lower cabinet for access to these. It sounds simple but from start to finish took a whole day. On the one hand, it's never worth it in terms of the money that this machine will earn, but on the other hand it is worth it to get the best from these tapes, knowing that they are so rare that there are very few businesses in the world who can run them. Inspired by all of this, I may try to find some time now to work on the untested SVR4004 which has been sat in my workshop since July 2014! My Aiwa F770 cassette deck had been out of action for some time becuase it would sometimes suffer wow (slowing) at the end of cassettes. During the fault condition, the capstans could be seen to be spinning freely (new belts were fitted a while ago) and after some work I decided that the pinch rollers had to be to blame. New pinch rollers were shockingly expensive at £55, but I finally went for it and bought some. Installation was a nightmare job, I got into a problem with some springs, but eventually they were fitted properly. The machine was tested and... still slow at the end of some tapes. I was about to cry, but decided to just crack on and solve the problem instead. It was caused by excessive back tension due to the grease inside the supply spool having gone sticky. Once replaced, the machine worked beatifully again. We could say the pinch rollers were an expensive waste of money, but let's instead say that they were preventative maintenance to keep the machine in tip top condition. We've bought a little handheld digital oscilloscope kit for use in the studio. My 7 year old boy is going to help with assembling that, he's looking forward to it. January 2017. A very busy month as is often the case for January with pent up demand for jobs that didn't need to be done by Christmas. Plans for a Commodore floppy disk data recovery service were set back when the 1540 drive broke down, flashing the red error LED four times which I think may be a ROM failure. So we bought a 1541 on eBay, let's see how that goes. December 2016. We're fully booked for Christmas, as of 6th December we're not taking any more orders for this year. As well as having over a week's work already lined up or coming in, we need time to clear tapes from completed jobs where customers have not already acknowledged that the tapes can be returned. We also need to tread carefully again such that we do not hit the VAT threshold. November 2016. We now can offer data recovery from PC and Mac 3.5" floppy disks, and 5.25" PC formatted floppies. We have resurected a very old Windows 95 / Windows XP dual boot machine and serviced a 5.25" 1.2MB floppy drive for the task. Other disk formats may follow including Commodore. We now have a (fairly small) 3D printer! This will hopefully allow us to print replacement plastic parts for video recorders, where new spares are no longer available. Examples may include: Cosmetic panels and front loading flaps, toothed gears, deck parts and cams. However we fully understand how the design of these parts is very time consuming. We've bought in another Sony J3 DigiBeta player, this time with SDI connection. We already have DigiBeta decks with SDI, but they are PAL only, whereas the J3 can handle more formats and also NTSC, so this allows for a pure digital transfer of a few more variants than were ottherwise possible. We also have our Sony J3 without SDI, which will be probably retain as a spare. We now have SDI output as well as input (capture) capability, which should allow for recording onto DigiBeta or DVCPRO. However things didn't go to plan, when the card was installed it "took over" the audio output from the video editing software, so muting to the computer's speakers. That won't do, so we need to have a think about the problem and work on it another time. Several new UPS units were installed this month due to old ones generally being underpowered. The mains power in this area is better than it used to be a few years ago, but still fails several times most years, from seconds to hours. October 2016. We now have our new Daikin air conditioning system installed by Recoair, which also has a remote control app so we can keep the computers at a sensible temperature even when we're not in the studio. This is going to be a huge help all year round since the equipment can generate more heat than could be removed by simply opening windows. We also used to suffer from bugs flying in if windows were open in the evenings! Better temperature control is also much kinder to the equipment, and the computers run quieter. Our new 4K Acer S277HK IPS monitor was not going well, there were intermittant picture flickers and crackles from the speakers. But the problem was sometimes so intermittant that I could hardly prove a fault to the supplier / manufacturer. This was all getting depressing, but the solution was simple: Replace the DisplayPort cable that came with it, for a new Dell cable. Problem solved. Strange, that. Now in, a Panasonic AJ-D950E DVCPRO-50 recorder with SDI connections, to allow for full quality original DVCPRO (25) and DVCPRO 50 transfers in both NTSC and PAL. We still need to find some space to mount this machine, but it's available for use now. We've bought in another Sony DSR-11 DVCAM/DV deck to help with throughput of large DV transfers, so we now have three fully working units plus one which is used primarily just as a analogue to digital converter. One of studio computers which had a win7 to win10 free upgrade license, got bricked when doing regular updates. So I had to "use up" a new Windows 10 key and reinstall Windows 10 from DVD, then reinstall all software. A very stressful day. I wasn't happy with the print performance from the HP Colour Laserjet 2605dn printer, a test print showed that the black cartrdige was giving slightly stripey results despute being and HP original which is 59% full. A replacement cartridge solved the problem. I have to say that I've found that branded non-original toner cartridges such as Xerox are at least as reliable as the HP originals, and problably better. Several HP colour toner cartridges have failed before they are empty. An interesting DAT issue: A customer had recorded audio onto a computer data DAT tape. The Tascam DA30MKII just spatt he tape out with an error code, it clearly wasn't happy about a computer backup tape being used for audio. However my Sony DTC-690 just ignored the incorrect tape tape and played it quite happily, so saved the day. It's always worth having a collection of different models of machines in case there are some oddball problems like this. September 2016. Heat management in the studio has become an issue, particularly over this summer but in general. We're getting some quotes for the installation of air conditioning, which we plan on having in place sooner rather than later - now booked for late September. Having snapped up some of the last Taiyo Yuden DVD-R (silver printable) DVDs in the UK, we can continue providing DVDs for some time, probably through 2017. Nontheless, there will come a time when DVD is not really an option unless we can find a suitable replacement for the highest quality DVDs ever made. Coming soon: A Panasonic AJ-D950E deck capable of DVCPRO-50 (and -25) playback. This machine will also allow for playback of NTSC as well as PAL recordings, and has a SDI digital output too, so will be a big step up in capability for the (quite rare) DVCPRO format. Our previous Panasonic AJ-D230 DVCPRO deck will probably be sold to help offset the cost. August 2016. We took much of August off, mainly for reasons of an impending VAT threshold. However we also took a break, and were able to keep in contact with the studio computers, CCTV and various other systems. We have a very robust setup which includes UPS systems (uninterruptible power supplies) on all machines. So what could possibly go wrong? Well while away, the CyberPower UPS responsible for powering the main router, blew up. So the very thing that was there to ensure reliable power, had instead caused a major headache. Though it's under guarantee, we're not putting that brand of UPS back in that critical function again and have ordered a new higher capacity model which will auto-restart upon power restoration even if it runs flat in a long outage. Furtunately though, even with the router being uncontactable, email was still accessible via another route, and the studio was checked over by other people. During the break, various background tasks could at last be handled, not least of which was bottoming out a problem with unreliable capture of certain video file formats from Digital Betacam. The cause was found to be that the firmware in a SDI capture card needed to be updated for reliable Windows 10 operation. July 2016. One PC has an 8-core AMD processor, and the noise from the CPU cooler on this thing was getting unbearable in the warm weather. No other cooling solution would fit the case, and very few cases would fit where the machine resided. However I eventually found a case which (just) fitted in the spot, and allowed a water cooled solution to be installed when the motherboard and all components were transplanted into the new case. The machine is now much, much quieter! However it still generates a lot of heat and isn't the fastest processor in the world, but it gets the job done. As an added bonus (?) the case looks quite similar to a Stormtrooper! There was no HDD activity LED on the case though, which is a problem because I need to check the HDD activity is low before video capture is started, so I drilled a hole into a blank and installed an LED (pink! ), resistor and wiring to the motherboard. JVC (Taiyo Yuden) has discontinued production of the very high quality DVD-R disks that we use, as DVD is becoming obsolete. Unless we can find a supplier of equally high quality DVDs, this will mean that we will have to consider the end of supplying DVD as a medium, sooner rather than later. Very few customers are still taking DVDs, nearly all customers now take video files on USB stick or hard disk. Still however DVDs can be required for elderly relatives who only have an old DVD player and TV. We've been having a few issues with the Ferrograph tape deck, but it's back with the supplier getting tweaked and we're hopeful that it will all come good shortly. The Sony TDC-690 DAT machine broke down, which was depressing. Close examination of the problem showed that the reel motor was intermittently slow to start, and a little Servisol switch cleaner squirted into that motor completely solved the problem. Even so, it would be preferable to replace the motor so I'm going to try to source one. In the mean time, the Tascam DA-30MKII has earned a great deal of respect from me and some of my regular DAT customers, so I've re-configured my audio kit so that it's now the default DAT machine. By re-arranging some little-used machines, we've been able to bring on more capacity with Umatic so we can now easily run two Umatic tapes at once without the need to lug machines around. It also makes the High band / SP (only) BVU-850P more readily available. A Sony Beta had poor audio and so hadn't been in service. I convinced myself that the audio head must be worn and obtained a scrap machine to donate a head, but upon examination I really couldn't see any wear on the head. Half a rotation of the audio head azimuth adjustment made a massive improvement to the audio quality. I've had audio head azimuth errors on VHS machines before, but (possibly due to the more complicated tape path settings) have never seen it on an unmolested Beta before. Playing a pre-recorded music programme whilst listening to the audio on headphones gave the best possible adjustment without access to a Beta alignment tape. Without wishing to give away too many details, the security camera system has now been upgraded to high definition. However spiders still find the outdoor cameras are a great place to build their webs. My eldest son is now the official "Arachnid Annoyer" and goes out with a long tickling stick affair most evenings to earn his pocket money by clearing webs. June 2016. We bought in another (making three) Panasonic AG-4700 video recorder, which is essentially an NV-HS1000 in a different colour and with a simpler remote. However, though it was supposed to work, it had mechanical issues which required a lot of attention before it could be used. While sorting that out, I also swapped some heads and other parts around between two NV-HS950 machines which were out of service, and so brought one of those on-line. The capabilities of the NV-HS950 and NV-HS1000 / AG-4700 are virtually identical, but I have a slight preference for the latter mainly because there are more functions available on the front panel rather than by remote control. I see though that there is no integral head cleaner in the HS1000/AG4700 models even though they use the same deck as the HS950. A Sony DCR-TRV120E Digital8 camcorder was running a customer tape, when it suddenly stopped, spat the tape out, and refused to ever work again. It's frustrating when kit breaks down like this, but it's a fact of life that things wear out. Some equipment I can repair, but deck faults on camcorders tend to be terminal. Our landline 'phone was out of action for several days this month, but thankfully B.T. have now finally sorted the fault. Since broadband kept going even when the 'phone line was down, it wasn't the disaster it could have been. The computer monitor on our main PC was starting to suffer from a yellow cast, which made it hard to use for some critical applications. It's been replaced by a Acer S277HK, a 4K resolution IPS technology display, which is superb but taking a little time to get used to. The resolution is almost too high. We will be closed for most of August 2016. There are several reasons for this, but the impending doom of the VAT threshold is the overriding one. Usually when we take a break, we try hard to get customers work done before and after that break so as to minimise the amount of customers we don't complete work for, but unfortunately on this occasion we actually have to turn the work down for that month. It's frustrating that as a small business, we work hard to build up a large client base of repeat customers, but now find ourselves forced to turn down work and to shrink the business. It's a very bad tax which artificially puts the brakes on commerce. But having to register for VAT would increase costs for no business gain. We support staying in Europe. We have some important customers throughout Europe and it is important that we can deal with those without complications around import and export duties.... Alas that's not the way things have turned out so now we can only hope for the best. If we have to pay import duties on work being sent to and from Europe then it's likely that European customers will avoid using UK businesses like us. May 2016. The Tascam 52 tape deck is being sold off for spares / repairs. We've bought (at considerable expense!) a specially modified and fully serviced Ferrograph Super 7 tape recorder which will run both 1/4 track and 1/2 track tapes. As well as replacing the defective Tascam deck, this one should also largely take the place the 1/4 track Akai 1721L. It will aso for the first time allow us to run 1/4 track recordings on 10.5" NAB spools, a capability we were previously lacking. We've bought this in from Servicesound, a specialist in tape recorders. For the first time in many years, we've had to go through the site and adjust pricing for some formats, particularly for transfers to DVDs. Some combinations of transfers to DVD were just not economically sensible with present postage rates and other costs, but we're still great value for money. Some other transfers, such as miniDV tapes to DV-AVI files remain at the remarkably low price of £7/hour for 10+ hours, and we've even lowered the cost for HDV tapes to video files. The latest upgrade to Windows 10 didn't work quite as well as hoped: The machine is an AMD model, and has several settings of power/noise/performance. The quiet mode we usually used with Windows 7, is now unstable with Windows 10. The system works fine in the noisier Turbo mode, but is offending my ears. We will have to see if there's a fix to that. In the mean time, two more machines were completed, so now 6 out of 6 of the studio desktop PCs are on Windows 10, leaving just an older ex-studio backup machine to configure. We do still also have Windows 7 and XP laptops, as well as a couple of Mac-Mini machines. Plusnet, our Internet Service Provider, have been great until a week ago. Then upload speed fell from 10Mb/s to 2MB/s, along with a small reduction in download speed, but I could see the link could perform better from the SNR Margin values reported by the router. After several helpdesk calls and emails, they eventually worked out that there was no technical problem at all, but they had deliberately dropped the upload speeds without telling me, due to a billing inconsistency at their end. They then agreed to put the service back to the way it should have been, at no charge, which they did. So on the one hand they sorted it at no charge, but on the other hand they caused me lots of problems due to a foul-up at their end and didn't even tell me what they were doing. So I was a little bit cross with them. Finally had a chance to properly test the PCM digital audio features of the Sony EV-S800 Video8 deck we got in a while ago. Very impressed. So we can now add this quite obscure format to our audio offerings. April 2016. Colin has been struck down by 'Flu and really needs to be given the first week of April to recover fully... Better now, thanks. We now have two Windows 10 machines in the studio, both working well. So we're taking the plunge and doing an upgrade of one of the existing Windows 7 machines. We already have a license for MacDrive software to be upgraded since MacDrive version 9 doesn't work under Windows 10. Other than that, hopefully it will all work. What could possibly go wrong?..... Well actually, with MacDrive updated, everything went well and the machine was back in service within the day. We will do one PC per fortnight to make sure there are no hidden problems. March 2016. We're doing other things for Easter weekend and the following week so will be unavailable until April. We've been busy. Replaced the aging desktop PC which handles emails, spreadsheets and some video capture and editing work; though working fine it was dangerously old and too slow for some work. Bought a monster gaming PC from Ebuyer, with Windows 10 pre-installed, plus some extra hard disks, DVD writer, ports and cables etc. Transferred lots of software and data over from old Windows 7 machine. What could possibly go wrong with a plan like that? Well, quite a lot as it happens. Pinnacle Studio refused to capture from a Canopus AD-VC55 on this machine, though the same software would capture from a Sony miniDV or DVCAM deck in E-E mode, and the Canopus works on another Windows 10 machine, and indeed on this one with WinDV freeware. Worse though was various bits of Nero didn't work reliably, even when updated to the latest version (waste of money that was then! ), but freeware burning software works, so still trying to sort that. Had heaps of problems with the new Epson XP-55 printer but solved that by using a USB2 rather than USB3 connection. It's been a rocky couple of weeks, and some of the work-arounds are not pretty. However the new machine is ferociously fast at editing and processing, so it will be worth it all in the end. Power supply is intermittently very noisy but I'm not getting quite the backup from PC Specialist that I might have hoped for.... got a replacement power supply installed now so it no longer sounds like a bag of nails. Solved a problem with another Windows 10 computer: It would capture DV using WinDV but would drop frames with Pinnacle Studio. Fitting a new Toshiba high performance hard disk solved that problem Total disk capacity across all systems is approaching 100TB, or 0.1 PetaByte. Our lovely Tascam 52 tape deck broke down. One problem was the tape lifter not retracting properly, a lubrication issue that I was able to resolve. However there also appears to be a takeup spool issue, it's running all the time, which is not right. It may be unusable as it stands, so that will stop us running any large spool tapes until it's either fixed or replaced. Tascam service aren't replying to emails so I guess they can't help - but a reply would have been nice. Service information seems to be unavailable, and it's also a big lump to dismantle, so it may be a dead loss. 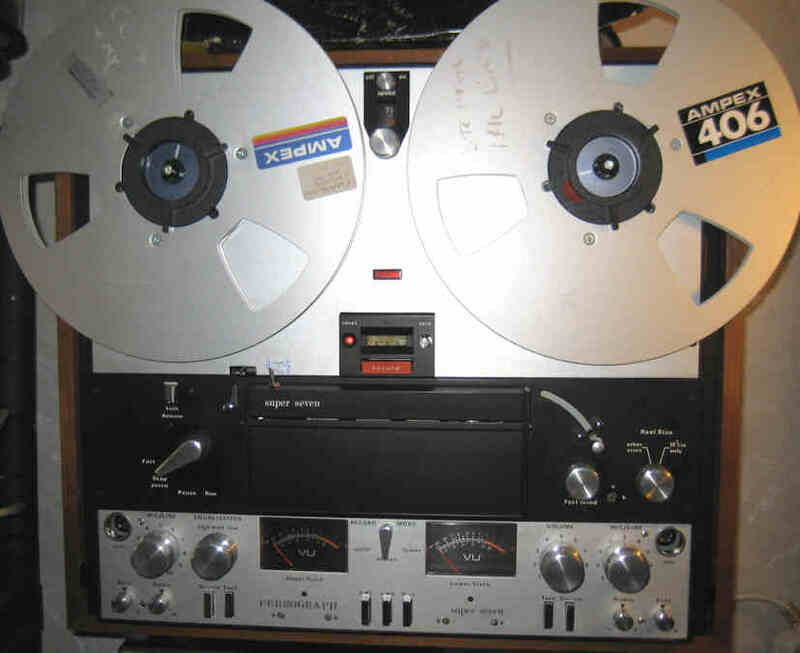 If anyone has a large reel-reel tape deck for sale which takes NAB spools and runs 15ips speed, please let me know. Tascam Service are unable to assist. Our local post office is being refurbished from 10th - 21st March, which is making postage rather difficult for certain types and sizes of package. Will just have to muddle along. February 2016. Bought a spare DSR-11 on eBay in "worked before we lost the adaptor" condition. Did it heck work, the cassette carriage is all messed up. Maybe I can fix it, maybe not.... Spent a few hours on it and now have it working. Most of the time anyway. The mode switch probably could use replacement, it occasionally doesn't recognise that it has reached the unlace position, but it's useable. Just need another power supply or suitable plug. Had a JVC DR-MH300 go all wonky and strange on me. No time to fix that for a while, and may not be fixable anyway, so had to swap it out, but now have no spare units so looking to buy some more MH200/MH300 DVD recorders. Most customers take video files rather than DVDs, but still enough do take DVDs that I need to have several DVD recorders handy. Bought a scrap DR-MH20, repaired the power supply (capacitors as usual) and was rewarded with a lovely working machine. Very pleased with myself for about an hour when the hard disk failed. They are not replaceble (being a special firmware vaiant) so I at least was able to put the DVD writer into a DR-MH200 which had burnt out its writer, so still got a good working machine out of it. And a spare serviced power supply for another day. Bought a Sanyo Beta NTSC machine (had been imported from USA) on eBay in "worked when put away" condition. Well no it didn't because some fool had plugged this 110V unit into 240V. Fortunately though, I've been able to recover the situation, though don't have a BII or BIII NTSC Beta tape with colour recording handy to complete testing just at the moment. Looks good with an NTSC PCM-F1 ditigal audio recording though. January 2016.One of my DSR-11 DVCAM decks was a bit mashed up by a cusomer's tape last month, the customer had put a sticky label on the wrong part of a miniDV tape and it jammed the mechanism. I was eventually able to fix that at the time, but now I find that the Firewire port (which had become a bit worn over the years) was too unreliable. The solution was not simple: I dismantled a scrap miniDV camcorder and raided the Firewire socket, but this had a different footprint from the original because the socket's "notch" was the other way round. So I had to mount the socket upside down on the PCB, which was fiddly in the extreme. One of the pins fell out and had to be very carefully refitted. After a couple of long hours, the socket was installed solidly, fitted the cabinet properly, and works with complete reliability. Not a job I would like to have to do again. Bought in some new spare Firewire sockets for any similar jobs in the future. December 2015. Wow! That was a busy December. Much as I try to make every customer happy, there came a point when I had to turn some work down in December because the workload was getting silly. Most customers now are taking video transfers as DV-AVI files on hard disk, ideal for all PC and Mac video editing software. But a few people still need DVDs, and it's the large sets of tapes to DVDs which eventually became the bottleneck. I'm expecting fewer and fewer DVD transfer requests over the next year, and I will need to redesign my main video99 logo to reflect this. Graphic Designer anyone out there? November 2015. Life gets a little complicated for a while now. Each Monday I will be looking after little Max who is now 1 year old. I'll still be working on Mondays too, but it may be best to avoid long and complicated 'phone calls on Mondays, and emails may be a little briefer than at other times. But we will manage. We now have upgraded the wetransfer.com account to the Plus service which allows for uploading files of up to 20GB. Your hard working engineer has suffered a bout of Man Flu in mid-November, so throughput has been very slightly slower than normal. The Epson R285 we use for printing CDs and DVDs is getting worn out. It needs a lot of cleaning and attention, or it dumps ink onto the internal rollers and then smudges it onto the CDs / DVDs. It also has a full waste ink tank so has a "Printer Potty" hanging out the back (very attractive!). Soon it will require another special release code because it will think the waste tanks are full for a second time. So we have a new Epson XP-55 printer to replace it, which works well. Good days, bad days... I had to give up a planned weekend away due to overwork. Then, perhaps due to tiredness, I accidentally plugged a Firewire cable in the wrong way round - which is something that certain combinations of large Firewire connectors will do (due to poor design and socket wear). The Digital8 camcorder at the end of the cable wasn't even switched on, but still the Firewire port was fried in an instant. OK, thought I, make the best of a bad job and "borrow" the pinch roller from this camcorder to put into another Digital8 camcorder which has a worn, shiny pinch roller. That I managed to do, but in removing the good pinch roller I managed to cause a tape guide to fall out of the mechanism, thereby wrecking it. On the one hand, at the end of the day I had the same amount of working machines as I did at the start, on the other hand I had utterly devastated a perfectly good Digital8 machine, which was valuable and useful. October 2015. We'll not give out too much detail on the fact that the security camera system has had some worthwhile maintenance and upgrades, with more planned shortly. It transpires that a defective power cable causing glitchy power to a camera, can cause failure of the camera's Infra Red filter, and so result in a pink colour cast on the pictures. It's a fairly common fault apparently. A replaced cable and upgraded camera were therefore just part of the work we carried out. September 2015. The main computer used for emails, billing, spreadsheets etc., has now been treated with a CMStorm Trigger-Z high grade keyboard. These are sold primarily as gaming keyboards, but the Cherry Brown type key switches are excellent for typists. Your engineer Colin is a rare breed, a male who actually learned to properly touch-type, and wife Jane is also a trained typist, so we both really appreciate this high quality keyboard. However mechanical keyboards are a little noiser than cheap keyboards, so I've retained the old Microsoft one for occasional use when noise may be a problem. The old Mac Mini was starting to act up, with spinning colourwheels and a general lack of success. It's not been needed quite so much now we use MacDrive software on our PCs for Mac disk access, but it was still useful to have a real Mac sometimes. An attempt at re-installing the operating system caused it to completely brick. A brief visit to the local Apple Store (not a place I tend to hang out!) and we left with a brand new Mac Mini. This did not go well.... After a few minutes of use, the mouse and keyboard would stall momentarily on the new Mac Mini, until rebooted. This cycle kept repeating. So back it went for a swap out for another new Mac Mini. And guess what... Just the same! In the process of trying to debug the problem, I had cause to connect up an alternative monitor to the new Mac Mini, and... fault gone! The problem was that the monitor we had used was the same as used on our old Mac Mini, which had a DVI socket. We had connected the new Mac Mini to the monitor via a DVI to HDMI adaptor cable, and I suspect that the problem lay here, the new Mac Mini was handshaking with the monitor regarding resolution and during this time the mouse stalled. I bought in a new HDMI equipped monitor for the new Mac Mini. The story goes on just a little further: Some experiments implied that the old Mac Mini had a memory problem, and removing half the memory allowed it to work. I then re-fitted the memory with the modules swapped into each other's slots and the unit now worked reliably. So that is now in operation as a media server and backup Mac. The new broadband service from Plusnet was supplied with a separate modem and router, neither of which seemed particularly inspiring pieces of kit - especially the router which was just pitiful. So having been in place for less than 2 weeks, they were turfed out and replaced with a much more sophisticated combined router and VDSL modem. These are powered from a UPS (Uninterruptible Power Supply) so that broadband (and telephones) will continue to function for a considerable time in the event of a power failure. The new router no longer resides in the studio, but is placed right next to the incoming line for the best possible signal quality. The Gigabit LAN switch however remains in the studio for high speed data transfer between the computers. Trying to prove to my long sufferring wife that we don't just acquire more and more kit, I've sold a Sony Betacam UVW1200P BetacamSP player since we had more than we need. I may regret it one day of course. August 2015. We now have a Sony DVW-A500P Digital Betacam recorder which, when paired with our DVW-A510P will allow for duplication of Digital Betacam tapes, or for transfer of analogue BetacamSP to Digital Betacam. The next part of this setup will be the purchase an SDI digital output card so that we can record digital video clips onto Digital Betacam for use by TV studios (planned for later this year). New high speed broadband installed, in particular the upload speed is around 10 times the old broadband, which is particularly helpful when uploading large files via wetransfer.com. Really delighted to add a Sanyo TRC-6010 Microcassette dicatation machine to join the Sanyo TRC-7060 Minicassette one. It's strange that Sanyo backed both formats, but they're excellent machines. The Microcassette model will mean we don't have to use an Olympus Pearlcorder so much (since it gave best results on batteries so was expensive to run), but the latter is still helpful for being easy to adjust to suit tapes which have been recorded with incorrect head azimuth. Incorrect head azimuth is depressingly common on the Microcassette format. We have the capability to recover data from PC and Mac 3.5" floppy disks. We may also be able to set up 5.25" PC formatted floppy disks, and I'm working towards also being able to offer data recovery from Commodore 1541 floppies too. I have a Commodore VIC20 set up now. The 1541 has broken down but parts are on order. I also have a Parallel to Commodore serial interface device somewhere, but need to find it or build another. Update: Fixed the 1541, needed a new 6522 PIO chip. July 2015. A Tascam DA-30MKII DAT deck was purchased to replace the ailing DTC1000-ES machine, but it didn't go very well initially. A tiny drive belt, the smallest I've ever seen, sits on the underside of the deck and works the lace up / unlace mechanism, it had stretched and so operation was unreliable. A replacement was hard to source but well worth it. Better still I was able to source the cable-connected remote control for this machine. After some cosmetic work, the machine is now lovely, and works every bit as well as the Sony DTC-690. June 2015. My big Panasonic AU-750 MII deck broke down, it was failing to eject tapes. However it turned out to be a lubrication problem with the "Heath Robinson" style tape guides which should move out of the way during unlace. Some silicone grease and wiggling was all that was required, but from start to finish was over an hour and quite a bit of stress. A customer was struggling a little with some 10bit YUV files from MII (the same 100GB/hour files as can be supplied from DigiBeta). Some software was causing visible interlacing breakup during movement. I was about to re-run the tapes as DV-AVI files, when he found the solution at his end; he downloaded Adobe Premier (professional) and it worked well with these large 10bit YUV files. Sometimes things die. My Sony dtc1000-es (backup) DAT deck expired today. Initially it had loading problems, and I was able to resolve those with a new belt and some lubricant. However then the sound was (and still is) intermittent. There seems to be no way forward on that given the huge complexity of this elderly deck, so I'm having to retire it, at least for now. So I'm in the market for another DAT deck. In the mean time, I still have a very nice Sony DTC-690 DAT machine so we've not lost any capabililty. The deck which died was only my backup machine. My main N1502 machine was starting to get fussy about which tapes it would play properly. Some were great, others seemed a little fiddly to set up. I have another N1502 in which is on my "to be fixed one day" pile, but the heads are certainly good, so I swapped them over and any playback issues were completely resolved. I also have a working backup N1502 deck too, useful with machines of this sort of vintage. I'm always looking for spare N1500/N1502 video heads. May 2015. Some of the shelving in the studio had been bought in a hurry when we moved in a little over two years ago. Those black plastic shelves had sagged badly under load and were now unstable. But it wasn't straightforward finding replacement shelves of the right strength, design and dimensions to replace them. A large replacement unit having been obtained (though a less than ideal design in terms of material and finish), it sat in its box until I had a whole free day, to clear all the equipment from the old shelves, labelling cables as I went, removed the plastic shelves, build the new shelving unit, refit all the equipment in an improved layout and cable it all up. Such it was that I had a very exhausting Monday! In the end, though I don't like the cosmetics of the shelves very much, we do now have something safe, solid, and giving more useful equipment space than before. With the move away from DVDs towards video files that we've seen over the last few years (now only about 20% of work is to DVD), I've made space to install another video capture computer which I plan to build in the autumn. There's just one more plastic shelving unit left to replace, when I have time. April 2015. Alas sometimes even we have to write off a piece of equipment, and such it was that one of our Sony EV-S9000E Hi8 decks has had to be scrapped. There was an insurmountable problem with the FM audio when playing mono recordings, the fault lay on the main board which is virtually impossible to fault-find, additionally there were mechanical problems and a TBC failure. However we still have plenty of these machines in service for those jobs which require them. March 2015. Having trouble with the Epson R285 CD/DVD printer. A new disc tray helped significantly, but it's still less than perfect. Another printing solution may be required longer term. February 2015. Sometimes even an experienced engineer can miss the obvious, and so it was when I had trouble with a Philips N1502 machine taking an increasingly long time to stabilise the head servo when switched on. I spent lots of time worrying about and testing servo circuits, before finding that the head drum belt was slipping slightly. Silly me. New belts ordered from Cricklewood Electronics. January 2015. We now are now using MacDrive software, with two licenses, which helps to turn around work on Mac formatted (HFS+) hard disks quicker. We still have a Mac too, but the MacDrive software speeds up data transfer since all our video capture is done on a suite of custom built and tweaked Windows PCs. Most video capture to video files is done as DV-AVI files, ideal for all PC and Mac video editing software, but professional formats such as Digital Betacam can be supplied as even larger file formats. December 2014. We now have a G2 MSTC Ultima Multi Standard Timebase Corrector, which provided motion compensation PAL/NTSC standards conversion for studio quality results. November 2014. The PCM1610 is in and briefly tested, that seems to be working but there will be more testing to do. There is also a PCM100 though I understand that the PCM1610 will play everything and more than the PCM100, so it's probably fairly useless. A huge amount of work has come in towards the end of November, nearly all transfers to DV-AVI files rather than DVDs. I always recommend taking video files for larger collections of tapes in particular, they are higher quality, easier to edit, back up, share and upload than are DVDs. October 2014. The latest member of our family arrived on 26th October, a happy baby boy called Max, weighing 7 pounds 9 ounces. He seems to love listening to Acker Bilk "Stranger On The Shore" when he needs settling. We've bought in a Sony PCM1610 digital audio processor for Umatic digital audio tapes. However this is presently stored some miles away so it will likely be around the middle of November before we can get it in and try it out. It's been supplied as untested but from a working studio, so we're hopeful it will work or can be repaired. I've been looking for one of these for years. We were having print quality issues with HP Laserjet P3015 laser printer some months ago, it would create spotty printouts. It's generally only used for printing address labels but it was still not ideal. HP were quite helpful, they told me that since the problem would clear for a while when doing a cleaning page, that the fault was in the fuser. I ordered a (cheap) fuser film sleeve via Chinese eBay seller, installed that (fiddly job), and the spottiness problem was much better. But now the printer suffered from ghosting from the top of the page downwards. Another eBay seller, this one in USA, informed me that cheap fuser films cause this sort of problem, and was able to supply another fuser film. Installed that (still a fiddly job!) but now the prints look spectacularly good. I'm just hoping they stay that way. Meanwhile colour prints for DVD boxes come from the HP Laserjet 2605dn I bought in March, which works very well. Any web site which carries Google adverts should have a list of blocked sites that you don't want to carry, typically one's competitors! Such it is that video99 and colin99 websites had a list of around 100 competitor's web sites entered on Google as sites not to advertise, built up over the past three or four years. Recently I went through that list to see how many of them are still operating. To even my surprise, almost a third of them have vanished. Doesn't that say something about these dozens of fly-by-night little outfits who pop up and then vanish? Here at video99 we've been in our ever-expanding business since 2006. We expect to be here for at least another 20 years, as we continue to expand our huge range of audio and video formats. September 2014. The offsite store room is now vacated, a great step forward in tidying up our spare parts and scrap machines. We now also have the bulk eraser configured for easy disposal of used tapes, for those customers who don't want them back after transfer (though I generally do recommend taking tapes back, just in case!). All kinds of interesting things turned up during the move from the offsite store, so if you have an interest in old video equipment and need to buy a scrap machine such as a Sanyo Beta or Philips V2000 model, just ask in case I have what you need. There's also a depressingly large collection of recent VHS models, many of which probably work Other items include a Umatic edit controller, Industrial equipment like Weller Hot Plate controllers, GPIB cables, new-old stock laser printer drums, fusers etc. August 2014. We started construction of a new storage space so that we could clear out our offsite store room and keep all the spare equipment in one place. A time consuming job which was (more or less) completed in time for our summer holiday. July 2014. I've been given a second Grundig SVR4004 SVR/SVC format machine by a kind customer. Though I have a fully working example of this exceptionally rare machine already, I'm only too happy to have another one lined up to be serviced as soon as I get a few hours to get my head into it. I repaired the customer's Panasonic NV-HS950 for him, not something I make a habit of: It looked like a straightforward mechanical fault for which I keep the spare parts in stock, it actually turned into a nightmare because a transistor had failed deep in the main PCB, which gave odd symptoms and took many hours to trace. That just reminds me why I don't like to take on repairs! June 2014. Two recent additions to my systems include a BVU-850P SP/High Band Umatic deck, and a Pioneer LD-V4300D Laserdisc player. The family enjoyed watching Independence Day on Laserdisc! This is an NTSC / PAL model with integral timebase corrector so it's a machine I'm particularly pleased to have available. I've also been given a Philps N1520 VCR format machine, this is a particularly rare model which supports stereo sound, so I'm looking forward to working on that later in the year. May 2014. Back in March I bought a Philips N1700 machine via eBay. I fitted belts and lubricated the deck, had to replace the heads (I think possibly N1500 heads were installed, I will have to check that later), and generally encouraged it to work. Then, suddenly the whole machine expired. Fortunately I do have the diagrams, albeit these machines had lots of production variants, but I was able to isolate a defective I.C. in the power supply. I don't know, where's the quality control, a component made in 1978 fails in 2014! A new I.C. was obtained easily and the machine sprang into life. Of course I had to also install audio and video connectors and build a video buffer circuit, but at the end of all that I was rewarded with a lovely working machine, which means I now have a backup player for this pretty old format. -- Updated in August: This N1700 turned out to be so good that it's now my primary machine and my previous one is the backup. April 2014. Bought a JVC DR-MH300 DVD recorder on eBay at an excellent price. I was very pleased until it arrived. The seller thought it was fully working but either through lack of use or transport, the power supply would not start up. The PSU on this model is on the main PCB which makes access very poor, you have to strip everything down to get to it. Replaced a selection of bad capacitors including the 27uF 35V one right next to the heatsink, reassembled it, switched on, boot screen came up... sitting back happily watching the fruits of my labours... then the timer incdication started flickering and the machine would just sit there. After another 2 hours of trying different things, had to finally admit defeat. Even I have to give up sometimes, but after the HDV camcorder a few weeks back, I hope this isn't turning into a trend. March 2014. The solution to the HDV camcorder failure was to buy in a Sony HVR-M15AE deck, which not only provides capacity for small and large HDV tapes, but now at last means I can handle 1080p including 24p frame rate tapes. Not a cheap machine, but it means we won't get caught out with tapes we can't play. Sold the HDR-HC3E HDV camcorder for scrap. Bought an untested Philips VCR-LP N1700 machine. Drive belts ordered in, looking forward to working on it shortly. February 2014. Sometimes even I can't fix a fault, and such it was when I started getting error messages from the Sony HDR-HC3E camcorder which I use as an extra HDV player sometimes to augment the full size Sony HVR-M15E deck. Not wishing to have a single point of failure, something will have to be done! I've also had one of my fleet of JVC DR-MH200 DVD recorders fail, with a worn out DVD writer for which spares are not readily available. Fortunately I had a reserve machine to put into its place. What with several power cuts this month, I do wonder what else could be sent to try me! January 2014. If using a Mac with the latest Mavericks operating sytem, since Apple have managed to break Quicktime support for DV-AVI files, you may wish to install the earlier Quicktime 7 and one of its vital components called Perian. These will allow easy playback and importing into iMovie: QT 7.6.6. http://support.apple.com/kb/DL923 Perian http://perian.org These steps are only necessary if you are running Mavericks, and hopefully Apple will fix the bug before too long anyway. December 2013. After a mad Christmas rush, the last week before Christmas has fewer rush jobs and I can get on with some background tasks: I replaced the reel motor in a Sony VO-9850 Umatic recorder, and the pinch roller in a Digital8 player. We've obtained an NTSC Digital8 player which will make DV-AVI video capture from that format much easier. Most PAL Digital8 players will play NTSC but each time there is a gap in the recording, the capture process would abort. Using an NTSC deck solves that. It also overcomes a limitation of a previous analogue NTSC player I have which is mono, so until now I've not been able to obtain stereo sound from NTSC 8mm tapes recorded in Long Play. November 2013. We now have a Blackmagic Design Intensity Shuttle video capture unit for Component Video capture, mainly for MII. I have to say though it's not a unit I would recommend, it's very hard to get it to work reliably. I tried four of my machines, all of which have the necessary NEC USB3 chipsets, but only one of them works without dropping frames, hanging or ortherwise going haywire. Even then it only works with the manufacturer's supplied capture software, not within my preferred Pinnacle Studio. October 2013. Finally completed the 1000-tape job! Added another lovely Sony SL-HF100 Beta Hifi stereo video recorder to the collection. Two JVC DR-MH200 DVD recorders broke down this month, one of which has been repaired but the other may be terminal due to lack of available spare parts. September 2013. We had a few very busy weeks with a large job of almost 1000 tapes of various formats. Built another high performance PC for video capture, along with plenty of 3TB hard disks. August 2013. Took a couple of weeks off, now back to face the backlog of work! Now we have a Blackmagic SDI capture card installed, so we have the ability to capture Digital Betacam in a purely digital route, even uncompressed 10 bit video files if required but they are a shocking 94GB per hour. August 2013. We bought in a Sony Digital Betacam player DVW-A510P which acts as a backup for the Sony J3. July 2013. We bought in a Black Magic component video capture unit for use with MII and BetacamSP decks, but alas it was dead and had to be returned. The plan is to buy another one later in the year. For sale: BVW-35 Portable BetacamSP NTSC recorder. I tested this a couple of years ago, it played fine provided the TBC function was switched off. Can test again before sale. Offers around £50. Not video related but I wanted to tell the story: My beloved 1994 Toyota Celica died because the immobiliser's computer quit and the manufacturer can't support it any more. I was having nightmares about car crushers. Fortunately the manufacturer were able to give me enough information to bypass the defective unit initially to get the car going again, and then also the wiring details so I was able to fit a more modern equivalent. Joy all round, and the car crusher goes hungry. According to the Daily Telegraph, almost half of British men still have a hoard of music cassettes or records from their youth - despite no longer having the equipment to play them. And 40% still have a library of films on VHS or Betamax tapes despite upgrading to DVD, Blu-ray and streaming via the internet. ....and, in a survey, two thirds said they'd like to transfer all this old material to up-to-date formats - but lacked time and know-how. Well they can all come to video99.co.uk and we will help. June 2013. We now have a lovely addition to our MII equipment, the Panasonic AU-750 deck. It does seem quite strongly attracted to the centre of the Earth though (it takes two people to lift it!). May 2013. The studio has been redecorated, carpeted and rewired. Just a few details left to sort out, but I can start refitting the equipment now.... Now fully refitted with all equipment, it's a tidier place to work with much better electrical wiring. Electrics by Chapman Electrical, carpets by A.R.Jenkins, decoration by Ivan Langford of Yealmpton. Another Sony EV-S9000E failed, after being left unpowered for a while during redecoration. The playback picture had squiggling patterning when cold due to capacitors failing in the Digital Timebase Corrector. While there I replaced all the capacitors in the secondary of the power supply. The main display had segments playing up, a capacitor had leaked gunge onto the PCB behind the display, replaced capacitor (under screening can) and all cleaned up for a perfect machine. These machines are getting old now and capacitor failure is a common problem. Sony HC14E camcorder failed, it died completely after a capacitor dried out in the mains adaptor. Repaired the adaptor but the camcorder was lost. But I had another of the same model which had a burnt out firewire port and failed CCD, so stripped them both down and swapped over the parts from one to another to get one perfect unit. Dismantling camcorders is not for faint-hearted, there are dozens of screws to remove before you start to get anywhere, they are very fiddly. The Epson Photo R285 inkjet printer complained that internal parts need replacement. This means that the waste ink tank pads are full. Some software is available, but the key to work it costs a little bit, which allows the counter to be reset. Then I've ordered a waste ink tank add-on. April 2013 Bought in several non-working JVC DR-MH200 DVD recorders, got one fully working and another provided spares to repair one I had already. Remaining set of three to work on later, I should be able to get one more going but hard disks are the problem, they can't readily be replaced. A Sony EV-S9000E went down with a strange jagged picture until it had been left on for a while. In the non-working state, the picture could be restored by deselecting the Digital Timebase Corrector from the menus. A sure sign that it had capacitor failure in the TBC circuit, so I popped it into the workshop ready to do a long afternoon's work of replacing all the surface mount electrolytic capacitors. However to my surprise, I found that I had done this already, it must have been the first machine I did that to some years ago. However there are also two through-mounted 1uF non-polarised capacitors in there and these didn't look very good on my Peak Electronics ESR meter. Replaced, and machine now works fine. March 2013 We've been busy with all three of our printers: The Epson Photo R285 inkjet printer is used exclusively for printing on DVDs, but the disk tray was not working reliably. After some investigations, the cause was found to be that the tray was "drooping" slightly and so was colliding with the rollers when the disk loaded. By propping up the tray's guide with a box of staples (! ), the disk loading is now 100% reliable. The HP Laserjet 2100tn has been a solid workhorse monochrome laser printer used for all labels and business printing for many years. However it was heading towards needing another set of pickup rollers and separator pads, so I decided instead to invest in a slightly used HP Laserjet P3015, which is much faster and uses less power in standby. For sale: One HP Laserjet 2100tn with extra tray, memory upgrade and network port installed. The colour printed boxes option for DVDs uses an HP Color Laserjet 2605dn to print the inserts. These printers have a well known weakness in that they tend to such paper dust into the optical assembly, which causes print quality problems. It's also a right pain to get to. I had previously twice stripped down and cleaned the optical block, the last time in September 2012, but I had a feeling something still wasn't quite right with this printer. Prints were darker than they should have been and it didn't print properly at the far right edge of the paper. Closer inspection showed that the block had not been refitted in exactly the correct way last time, which is apparently a very common problem when cleaning it. I stripped it down again, cleaning it while it was apart, then very carefully locating the optical block and checking it by looking at it from the front where the toner carts are installed. After reassembly and recalibration, the printer is now producing fantastic results right to the edge of the paper.--- Update, no the print is faint. Partly caused by a bad black toner cart, but to get things moving quickly I replaced the printer with a refurbished one, £43 inc delivery. Now I can work on the old one in my spare time. One of my incredibly rare CVC Showcase machines kept shedding a drive belt when being used last week. The drive belts on these are just absurdly hard to get to and replace, but after an hour or so of struggling, a replacement was installed and it now works perfectly. Replaced all the surface mount capacitors in the Digital Timebase Corrector circuit of a Sony EVS-9000E Hi8 deck, because it was producing strange results when the TBC function was enabled. Now it works perfectly. It's a very big and painstaking job, there are over 30 capacitors to replace and some are quite fiddly, but I've now done this to three of my machines with 100% success. February 2013 The power supply rebuild of the JVC DR-MH200 was a complete success. In the mean time I've bought another of these machines and I'm working on replacing the hard disk (not as easy as it sounds). A DR-MH300 however had to be taken out of service since the DVD writer became increasingly fussy with which disks it could write to, so that requires a new DVD writer drive which could be hard to source. I do now have the service manuals for these machines which helps. We still have not been able to tie down the carpet fitters and decorators so that we can get the studio tidied up after the water ingress in December. When we do get them sorted, it will mean we're going to be unable to do any work for about a week, probably around late March. We wanted to get the studio power sockets re-wired at the same time but it looks like the costs are prohibitive so that will have to wait until next year. The Sony DCT-690 DAT machine broke down, almost immediately followed by the old DAT deck, leaving us struggling for a few hours! The DCT-690 deck had a wobbly internal gear because a retaining clip had popped off, causing the tape guides to fall out of alignment with each other. Really a DAT deck is very similar to a small video deck. Having fixed that, the older Sony deck was also persuaded back into life, getting us back to having a good machine and a spare. But it was stressful for a while. Proved that the Tascam DR-100MKII is capable of lossless digital capture from 48kHz DAT tapes, very impressive (superior to CD quality). January 2013 One of the PCs used for video capture, bombed out with an impossible-to-recover Windows 7 installation. Even re-installing Windows didn't work, in fact the Solid State (SSD) boot drive couldn't even be reformatted. This is the second Kingston 64GB SSD drive to fail, the other one the SATA data connector disintegrated. I'll not be using Kingston drives again. Fortunately I had a new SSD drive in for a new studio computer I was about to build, so I was able to install Windows and all my required software on that in a day and get the machine back on-line. A JVC DVD recorder DR-MH200 went out with a bang. The power supplies on these are known for capacitor failure, but in this case the STRG6653 regulator chip exploded, taking out with it a surface mount resistor beneath it, the mains fuse, and I suspect the rectifier too. Parts on order, hopefully it will all work when rebuilt and not just go bang again. Thanks to Richer Sounds for a good deal on some sweet little Sharp LC-19LE510K 19" TV monitors, two cost £99 each and a third in the sales at just £80. December 2012 Flood damaged studio! Technically an "escape of water" and we're very lucky that it's generally only cosmetic damage, very little equipment was affected. Even so, it's a proper pain and consuming lots of time. October - November 2012. We have moved! Now we have a proper studio dedicated to audio and video transfers and editing. The studio is now almost completely set up and is being equipped with some new equipment to increase capacity. Joy all round! We now have a Tascam DR-100MKII digital audio recorder from Richersounds (they ordered it in especially). This will simplify audio recordings, especially very long ones, and provide studio quality results. It also has a digital input for lossless digital copies from MD and DAT. Thanks to Richer Sounds for supplying that at a good price, even though it wasn't one of their normal stock items. Replaced an elderly DAT deck with a nice clean low-mileage Sony DCT-690 machine. But the cassette compartment seemed a bit gloomy so I couldn't resist a minor modication and added a diffuse LED so that the cassette is easier to see during use. Purchased a new UPS from Ebuyer so that each of our three main desktop PCs are UPS protected. Had a breakdown: JVC DR-MH300 DVD recorder refused to start up after a power outage, just a quiet ticking sound. This is not the easiest model to work on because there is no separate power supply board, but dismantled it, replaced the 27uF 35V capacitor in the power supply section (a common fault on JVC DVD recorders of various models), tested other electrolytic capacitors with an ESR meter, reassembled and had the machine back in service within the hour. September 2012. Slightly poor colour performance from the HP Laserjet 2605dn printer traced to paper dust on the optical assembly mirrors. A real pain to get to but this web site helped, as did HP's technical support people. Unreliable operation of a JVC DR-MH200 DVD recorder resolved by going through the power supply with an Effective Series Resistance (ESR) meter and replacing no less than nine capacitors which were high resistance and/or low capacitance. August 2012. A couple of weeks off in the sunshine, thanks for patience from those customers whose jobs had to work around that. July 2012. A hazard of running some antique formats is that the machines can a little quirky. Such it was that the mains filter capacitor of a Grundig 2x4 Super V2000 1984 vintage video recorder caught fire, fortunately when I was in the same room as the machine so was able to dive for the power switch before any damage was done. The video recorder was actually quite simple to repair, but the frayed nerves may take longer. Our hearts go out to those in our village of Yealmpton who have been affected by the flooding of 7th July 2012. Fortunately we are much higher up. June 2012. Latest acquisition is a Panasonic AG-7650 S-VHS player, actually two of them. These machines allow for completely variable linear and hifi audio mixing, which is a feature unavailable on virtually any other model of S-VHS machine, and they also include very nice integral Digital Timebase Corrector. Had a Panasonic NV-HS1000 break down on me, the plastic drive spiggot on the loading motor had developed a hairline crack, fortunately I was able to obtain one from a scrap machine of a similar model, but it was quite fiddly to fit since you can't easily get the deck out when a tape is stuck in it. More of these drive components, part number VDP1434, are on order. They are prone also to failure in the NV-HS900 and NV-HS950 models as well as others. Bought in another Canopus ADVC55 DV capture converter, now we have fourt of these. Also we now have a Sanyo VTC-NX100 Sanyo Beta machine which I've serviced and is in particularly nice condition. May 2012. Latest equipment in includes another Sony EV-S9000E Hi8 edit deck (late model version with better firmware), and another Sony SL-T50 multistandard Beta machine. Perhaps more importantly though we have another high performance computer built which helps with video capture when there is a lot of work in. Less good was that due to human error, a Philips N1502 machine was dropped and damaged, a mistake that cost several hours to put right. April 2012. Now we have the second (rare) CVC Showcase machine up and running, and also a JVC SR-DVM70EU minidv/DVD/hard disk recorder which was kindy donated to me in non-working order and I repaired it. I'm never happier than having my head in a piece of kit that other people can't seem to fix. Business is still very brisk, but a couple of days off over Easter was very welcome. March 2012. We now have bought in a second, incredibly rare CVC Showcase machine, which is undergoing repair now. Bought in two more of our favourite DVD recorder, the JVC DR-MH300, one in full working order the other which will have to be repaired. This month's disaster (! ): Lost some data on a very important spreadsheet when the boot drive ran out of space. Lessons learned: Regular backups, regular backups and then regular backups. February 2012. Just to prove to my long-suffering wife that I don't just keep collecting more and more kit, I actually sold a spare UVW1200P BetacamSP player this month, to one of my competitors! Well I do work for competitors too, several of them send me jobs they can't handle. Another disaster: Boot drive failure on one of my most important computers. Reinstalled everything, it lasted a week and went again! The problem? The SATA data cable on solid state boot drives (SSD) can be quite critical, it was a bit sloppy at one end, replaced it and also took an image of the boot drive onto a spare hard disk to make it easier to recover from this sort of thing in the future. Descovered that the backup and restore feature in Windows7 is next to useless if you are trying to restore to a different drive than the one the backup was made from, how hopeless is that! January 2012. Now we have yet another of our favourite Digital Timebase Corrector, these things are really hard to obtain but the manufacturer still supports them and so I'm able to get each one "tweaked" to operate just how I like them. A disaster: Plugged a Firewire cable the wrong way round into a socket (this isn't supposed to be possible but with some plug/socket combinations is an easy mistake), blew up a Canopus video capture unit. It might have been nice if the unit was a bit more robust and so didn't just blow up, but then the manufacturer woudn't have had the pleasure of charging me over £100 to repair it. December 2011. Now have a Tascam 52 tape deck which means we can handle up to 10.5" audio spools with/without NAB hubs at up to 15 IPS running speed. Exactly where we will store this 35kg monster we are yet to work out! November 2011. November was hideously busy at video99, and your engineer did rather burn himself out a bit. Also "burnt out" several pieces of equipment which will have to be serviced or replaced over Christmas. October 2011. Another Grundig 2x4 Super V2000 format machine now added to our collection, which is our favourite model for this format. Now that we have two of these, I'm happy to clear out the older Philips VR2023 and similar machines (so if you want to buy one, let me know). We now also have another Sony EV-S9000E Hi8 edit deck, taking the collection up to five of these. A seemingly simple upgrade to a computer system went hideously wrong, as these things can! We our main computer system was not fully operating for over a week. But at the end of it, we now have another machine running Windows 7, and a Solid State boot drive with HD5570 graphics card. I've had a customer job for a data transfer from 3.5" floppy disks (Mac formatted in this case). This has prompted setting up equipment to also retrieve data from 5.25" 1.2MB floppy disks, which I am now setting up, let's see if there's an interest in this. September 2011. A very busy time for us! Secam Umatic capability has now been restored with a replacement machine. August 2011. We now have a BluRay writer so we will in due course be able to make up BluRay HD films with that. In the mean time, it already allows for a useful way to provide BDRom disks of large DV-AVI files for customers who don't want to provide a hard disk. Oh dear, a breakdown: We have temporarily lost Umatic SECAM capability since our Sony VP-5040 multistandard Umatic player has developed a dead spot on its capstan motor. A replacement part, or more likely whole machine, is actively being sought. Our off-site storage space has moved and there is now more space to allow for easier access to equipment as required. Actually there is too much stuff there, so if someone is interested in a collection of Philips VR2021/2/3 etc. machines for spares, and spares for them, just let me know. Other scrap machines I have too many of may include various Beta (Betamax) machines from Sanyo and Sony, GPIB test equipment cables and ancillaries, certain BetacamSP players and more. July 2011. We now have a Twitter account and will be blogging information there in due course. As they say: Follow us on Twitter. After a bit of a disaster at the printers (to be fair, they sorted it out), we now have some lovely new business cards and will send them out with DVDs. If you could use extra ones for your friends and colleagues, just ask. June 2011. Another Canopus ADVC-55 video capture unit purchased, which helps with setting up tricky and non-standard capture configurations such as certain NTSC tapes to DV-AVI files. Our UVW1800P BetacamSP recorder is now in place and working nicely. Bought in some service kits so I now have added another Panasonic NV-HS950 S-VHS deck to the collection, these are amazing machines with an integral Digital Timebase Corrector, and along with the similar NV-HS1000 make up most of the machines I use for VHS and S-VHS transfers. May 2011. Now a JVC DR-MH300 recorder added, this is particularly useful for some of my casting agents customers who require off-air programmes to be captured for actors. Also new in, a UVW1800P which will allow us to record onto (as well as from) BetacamSP tapes for studio use. April 2011. Yet another JVC DR-MH200 Hard Disk / DVD recorder added to the collection, we really like these machines and also know how to service the power supplies to get the best from them. They offer more flexibility than other brands but it's a shame JVC have pulled out of the DVD recorder market. One more Panasonic S-VHS deck in place too. March 2011. We now have a new Digital Compact Cassette deck to get the very best from this quite obscure audio format. Added a new PCM-701 decoder for (usually Betamax) PCM audio, which is addition to the PCM-F1 unit we already had. Repaired a Sony SL-T50 so we now have extra multistandard Beta equipment available, just in case. February 2011. PCM-701 and PCM-601 digital audio on video cassettes (usually Betamax) can now be handled. January 2011. Oddly enough January is always a busy time, this year is no exception. No VAT rise here, since video99 quite deliberately works under the VAT threshold. Bought in a replacement NV-HS950 S-VHS video recorder since I was concerned that one of these was getting tired, and I'm only happy when I'm providing the very best results for my customers. Web form problem experienced in December is completely resolved, it was caused by a well-intentioned change made by my ISP. Off-site local storage finally filling up with about a ton of obsolete machines, spares, cables and other "will come in handy one day" clobber. December 2010. A very busy time, I had to limit the amount of work coming in so that I could keep all my promises, which I did, to complete work in time for Christmas. A few customers experienced a delay in my responding to requests on my automatic web form, apologies for that, it was a technical failure outside my control, which is now being worked on. November 2010. Work overload! Having to limit incoming work for this year now. Offsite storage available at last, for storing spare parts for older video formats such as N1500. Our loft can breathe a sigh of relief as a ton of equipment has been moved out! October 2010. The Christmas work is starting to arrive already, so if you have a job to be done in time for Christmas then please get it in as soon as possible before the big rush. More DVD recorder units (which include internal hard disks) are now on-line and helping to get work done more efficiently. Did you know: If you plug a miniDV camcorder into a PC via the firewire cable for video capture, that if you manage to accidentally fit the larger (6-pin) firewire plug in upside down, that it will fry the firewire port of your camcorder, possibly with a burning smell and a small puff of smoke? You do now. Guess how we found that out! To help with uploading video files for customers, we now have a very large upload/download bandwidth allowance with our broadband provider. September 2010. I've built a new and super-fast computer specifically for video capture in my small studio, which particularly helps with video capture from Umatic and BetacamSP sources. Now, unless there is a good reason to do otherwise, all Umatic and BetacamSP transfers to DVD will be Deluxe Menu. Furthermore, I have bought in a second Sony DSR-11 DVCAM deck to help with video domestic format video capture, DV and DVCAM transfers - this is also connected to the new computer system. All topped off with a new faster network system between computers, the new systems really help to get larger jobs done quickly and efficiently. (If you're interested, new PC has solid state boot drive, 2TB data drive and 6-core processor, hooked up to two monitors. Nice. But not forgetting our Apple Mac customers, the Mac Mini now has an internal 600GB hard disk which helps to speed up data transfers to HFS+ hard disks.) The effect on our electricity bill may be less good, and the gadget budget is well and truly blown for this month. August 2010. Still house hunting! In the mean time, I have put together another N1700 format machine since I had a large amount of these tapes come in. It has brand new heads and gives super results. 22nd July 2010. The best laid plans.... Our hopes for a move to larger premises came to nothing (apart from a great deal of expense) when the seller changed his mind just as we were ready to exchange contracts. So we are staying right here for the timebeing! July 2010. We expect to be unavailable for a few days around 12th - 16th July, while we start moving equipment out ready for the move to larger premises. Email will still be answered but we may not be able to tackle much transfer work during this time. Please bear with us and this time, it will all be worth it in the end. June 2010. Well you know what it's like buying a new place, it takes forever, but things are moving along. We still have full capability here but we're asking a few large commercial contract jobs to wait until later in the year where that is convenient for the customers. New in, an extra CD recorder system helps with larger audio transfer jobs. On the other hand, with a move imminent, we're selling off lots of spare equipment on eBay, see user name video99_co_uk there. April 2010. A little set-back. You hard working engineer Colin has hurt his back. But there's no delay for customers' work which carries on as usual. Some very obscure formats may be just a little harder due to the need to move heavy equipment around. March 2010. Now in: DVCPRO (DVCPRO25) support, this format is not easy to find transfer services for. That will complete our portfolio of video cassette formats; we now cover essentially every known format in the consumer and semi-pro arenas, as well as the popular studio formats. So we can say now with some pride: video99.co.uk covers the widest range of video cassette formats in the UK. Well you have to be a bit of a video enthusiast to get excited about that. February 2010. Well we had a very stressful time when one of our most important computers (server) died horribly. Fortunately we were able to get a replacement motherboard in and working the next day and so no work was delayed. We also increased our storage capacity to over 4.5TB. Furthermore the extra processing power allows us to turn around edited and Deluxe Menu DVDs even quicker, so perhaps it was a blessing in disguise. January 2010. Happy New Year to all of my customers, new and old. There's plenty of work on already but I'm still turning short jobs around next day, even the snow and ice doesn't slow us down. HDV (High Definition) miniDV tape capability for 1080i, the most popular High Def resolution is now available. This will be added to the miniDV page shortly. December 2009. It's been very, very busy over the last few weeks with the build-up to Christmas. We're now taking on work for delivery in the New Year and have plenty lined up. Thanks to all my customers over the last year, especially those who have even sent us Christmas cards, it's nice to be appreciated. November 2009. We have gained two new pieces of equipment this month. Firstly we have a Sony J3 Digital Betacam player, so we can now run Digital Betacam, BetacamSX and MPEG IMX studio tapes at last. This was a major investment, being much and away the most expensive piece of kit we have ever had to buy, but already it has been busy running tapes for several customers. Next we have now imported and serviced a CVC format machine suitable for NTSC tapes from USA. Video99 is probably the only transfer business in the world to support both PAL and NTSC recordings in the very rare CVC format. We can now also run Betacam tapes of the NTSC system for both small and large tape sizes, as well as PAL of course. In other words, we really do have one of the widest range of video cassette formats available in the UK. Other formats planned are at least the most popular HDV High-Def formats on DV tape, and perhaps the more popular DVCPRO tape sizes, though users of both of these formats usually are aware that it's usually easier to play the tape on the original recorder than try to find someone to run them later. October 2009. The postal strikes are not causing us any particular problem. I always recommend people send their tapes by Special Delivery, and this service is working as normal throughout the disruption. I've had three customers tell me that their disks did not arrive promptly, so I sent out replacements (free of charge) and in both cases those replacements arrived next day. So far, then, so good. From December 2009 we plan to support all Digital Betacam and Betacam SX formats as a result of the purchase of a very expensive Sony J3 player. September 2009. We now have an extra two High Band / SP capable Umatic machines available as well as the original one we've had for some time. This gives us more backup and capacity for this important format. Many transfer businesses say they run Umatic but will let you down with High Band or SP recordings. We also cover SECAM and NTSC Umatic recordings, and perhaps uniquely in the UK can handle NTSC SP (High Band) tapes too. We love Umatic! We are delighted to announce that we now have capability for the obscure professional format called MII (or M2, M11) and this will be added to the web order form shortly. There are very few other UK businesses offering this format. We have increased capacity by adding a fourth Digital Timebase Corrector / Standards Converter to our systems. These are expensive units, and most small transfer businesses don't have them. 28th June 2009. Ours is a family run business, and we're pleased to announce that the latest addition to the McCormick household: A healthy little boy called Scott arrived at 06:02 on 28.06.09, weight 8lb 1oz. Mother and baby doing fine. June 2009. Expected at the end of 2009, we plan to offer the obsolete MII (M2) professional video cassette format, we have a Panasonic AU-65H machine coming in for this, but it will need servicing. Very rare. May 2009. We have a new CD and DVD printer in for improved print quality and to make custom DVD prints more quickly. 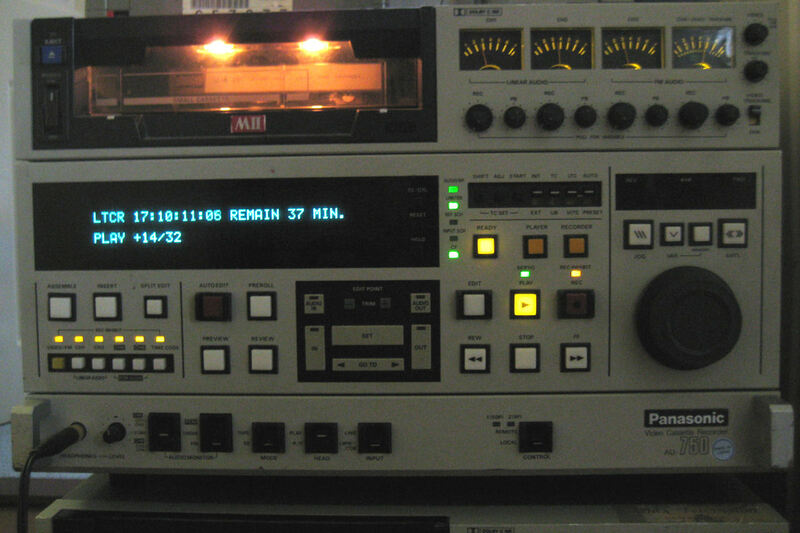 A spare BVW-22P has been purchased which is particularly helpful for low band Betacam tapes. April 2009. We have a Sony SL-T30 multistandard Betamax machine now in which helps particularly with foreign NTSC and Secam Betamax recordings. March 2009. We now have a third Digital Timebase Corrector available to help throughput for larger jobs of many formats. Also now available for use is our third BetacamSP player and the fourth EVS9000E Hi8 edit deck. Regarding the purchase in of hard disks for my customers: I'm sorry to say that the discount shipping of hard disks for my customers from SVP is no longer available due to a change in their shipping systems. They are still however very competitive and you can order a drive from them for any DV-AVI hard disk transfer I may do for you, and have the drive shipped directly to me. Other suppliers such as Ebuyer, DABS and Amazon can often also accept an alternative shipping address in the same way. February 2009. We now have a brand new Apple Mac Mini. This will help us to format hard disks for Apple customers who have previously had to put up with the NTFS file format, which Macs can read but not write to. More S-VHS decks with built-in Digital Timebase Correctors have been purchased, and these will be on-line soon and available to help with "wobbly" VHS and S-VHS recordings. January 2009. We now have a backup working CVC deck. Not many transfer businesses have one of these ultra-rare machines, let alone two! Betacam / BetacamSP NTSC capability now available and tested, for the small video cassette size. PAL tapes can be accepted in both small and large cassettes. A new Digital Timebase Corrector has been installed which significantly increases our capacity for SVHS/VHS and Betamax. December 2008. We had a very busy Christmas workload, but completed all work in time for Christmas that was promised, and quite a few which were not promised too. We still have plenty of work on, going into the New Year. New equipment in to be serviced includes: Another Sony EVS9000E edit deck which when serviced will take to four the number of these highly capable units available to us. Also we have a V2000 deck capable of Long Play (XP) recordings, which hopefully will be ready next year. Also in to be serviced is a third BetacamSP player. We now also have an NTSC compatible DVD recorder in, which makes it much easier to create DVDs for viewing in USA/Canada. Another DAT player has been purchased for more capacity on this audio format. The web site has a new look, much trimmed down for a cleaner appearance, but all the information is still available. Next year (?) it will get a redesign with tabs for easy navigation. November 2008. The Christmas rush has most certainly started, and we're very busy. We aim to guarantee that all work received by 12th December will be completed in time for Christmas. Work received later than that, we'll do what we can. Turnaround for smaller jobs is still just a few days to a week. We are proud to announce that now have the exquisitely rare Technicolor/Funai CVC format online at last. There may only be a dozen or so of these machines left working in Europe. The main video99 web page has undergone a major overhaul to reduce its size and complexity. If you find any bugs, please let me know. October 2008. You would think that video99 never gets caught out with a tape we can't run. But occasionally even we get a tricky one! In this case, we discovered that Digital8 equipment, whilst capable of playing both PAL and NTSC analogue Video8 and Hi8 tapes, is not capable of playing NTSC Long Play recordings. Not to be outdone though, we bought in suitable equipment just for a single job (so effectively made a loss on the transfer), but still were able to complete the work promptly for the customer. He was delighted, and so then were we. Also this month we have bought in more minidisc equipment so we can carry out pure digital transfers of LP2 and LP4 minidiscs. Sept 2008. We are now back from our well earned break, and clearing a backlog of tasks over the next week or so. Thanks to my customers for their patience over the last couple of weeks. Aug 2008. Now with more BetacamSP equipment available for even faster turnarounds on this format. July 2008. The ComputerActive magazine for this month carried an item on video transfers, and included a mention of the video99.co.uk web site under the Betamax format. Of course, we do all formats, but the recommendation was nice and we are getting in lots of Beta tapes lately as a result! June 2008. We can now handle Betamax tapes recorded on very early NTSC equipment which ran at the BetaI or Beta 1 speed (1 hour on an L500 tape), as well as the more common BetaII and BetaIII speeds. We are probably the only UK transfer outfit with NTSC Beta1 capability, and even in NTSC countries it will be pretty rare. We are using a professional Sony SLO-320 machine which is in excellent condition. We presently have on loan a CVC format machine, but may have to return this to its rightful owner (depending on being able to source spares for a second machine). So now is a good time to ask about CVC format tapes from the Technicolor portables of the early 1980's. Your video transfer engineer Colin is recovering well from a Wisdom Tooth extraction and has now caught up with all transfers so there is no significant backlog. Short jobs are often turned around same day. We now can cover both the mini cassette and microcassette dictation / answering machine formats. as well of course as regular Compact Cassette and other audio formats. May 2008. We try to have backup equipment for all important formats so that you will not be let down in the unlikely event that equipment requires service. We are pleased to say that we now have duplicate video equipment online for Digital8 and micromv formats, which joins the duplicates we already have available for VHS, SVHS, Betamax, Betacam, Umatic, V2000, Video8, Hi8 and miniDV. We also now have in a DCC (Digital Compact Cassette) machine for audio transfers, but require a cassette to fully test this facility. If you have a DCC tape, let us know. April 2008. We now have an arrangement set up with the excellent supplier of computer equipment and consumables, www.svp.co.uk who will provide hard drives directly to us for customers. You can select any Freecom external hard disk from their web site, and have it sent straight to video99 for your video transfers, at just 99p shipping. This is ideal for customers who require tapes put onto hard disk in DV-AVI format but don't have a suitable drive already. Just contact us for details on the necessary shipping address and coupon code with SVP. February 2008. After a short break due to difficulty in obtaining spares, the N1500 (Philips VCR) format is now back and fully available. We have also obtained sufficient spare parts that we hope to be able to continue with this format indefinitely. January 2008. We are pleased to add the exquisitely rare Grundig SVR format to our portfolio, Grundig model SVR4004. This is useful because recordings on VCR tapes could be any of the N1500, N1700 or SVR formats, and you can't tell which until the tape is played. We believe that video99 is the only transfer company in the world capable of handling all three of these variants. See the VCR format transfer page. I can be contacted here if you have any questions or comments. We have a new and easy order page, just select what kind of tapes you have and supply your details.